• To View the presentation as a slideshow with effects select “View” on the menu bar and click on “Slide Show”, or simply press F5 on the top row of your keyboard. • To advance to the next slide click the left mouse button once. 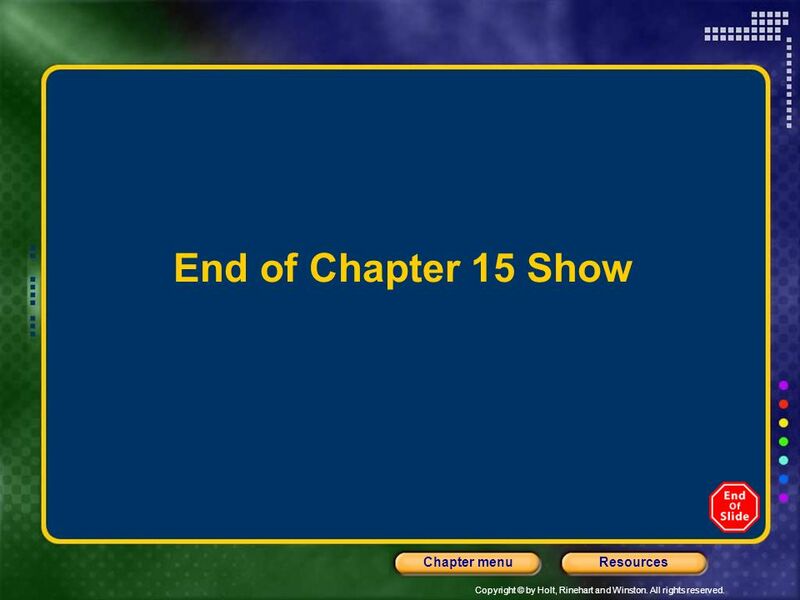 • From the Chapter screen you can click on any section to go directly to that section’s presentation. • Blank or “missing” areas of a slide will remain hidden until the left mouse button is clicked. 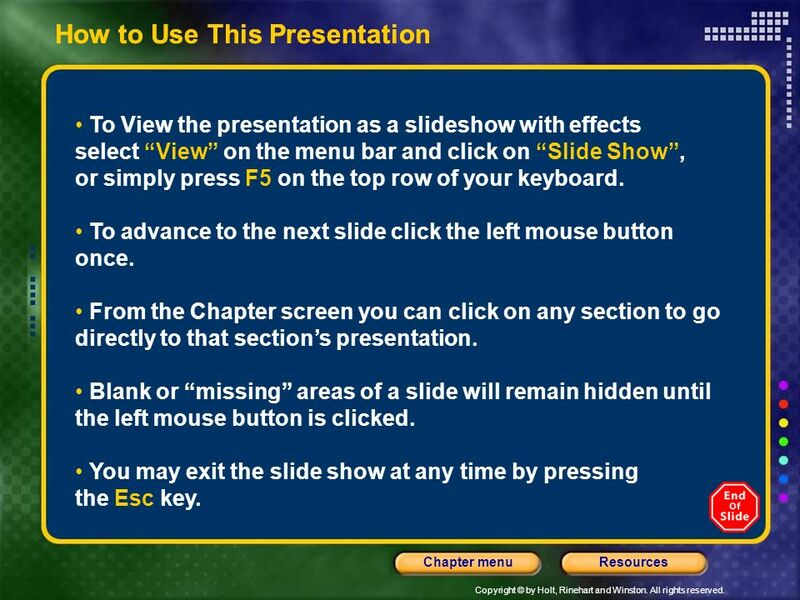 • You may exit the slide show at any time by pressing the Esc key. Header – dark yellow 24 points Arial Bold Body text – white 20 points Arial Bold, dark yellow highlights Bullets – dark yellow Copyright – white 12 points Arial Size: Height: 7.52" Width: 10.02" Scale: 70% Position on slide: Horizontal - 0" Vertical - 0"
The Atmosphere Table of Contents Section 1 Characteristics of the Atmosphere Section 2 Atmospheric Heating Section 3 Global Winds and Local Winds Section 4 Air Pollution Section 5 Maintaining Air Quality Header – dark yellow 24 points Arial Bold Body text – white 20 points Arial Bold, dark yellow highlights Bullets – dark yellow Copyright – white 12 points Arial Size: Height: 7.52" Width: 10.02" Scale: 70% Position on slide: Horizontal - 0" Vertical - 0"
Chapter 15 Bellringer List the ways that the atmosphere is different from outer space. Write your list in your science journal. Header – dark yellow 24 points Arial Bold Body text – white 20 points Arial Bold, dark yellow highlights Bullets – dark yellow Copyright – white 12 points Arial Size: Height: 7.52" Width: 10.02" Scale: 70% Position on slide: Horizontal - 0" Vertical - 0"
5 Chapter 15 Objectives Describe the composition of Earth’s atmosphere. 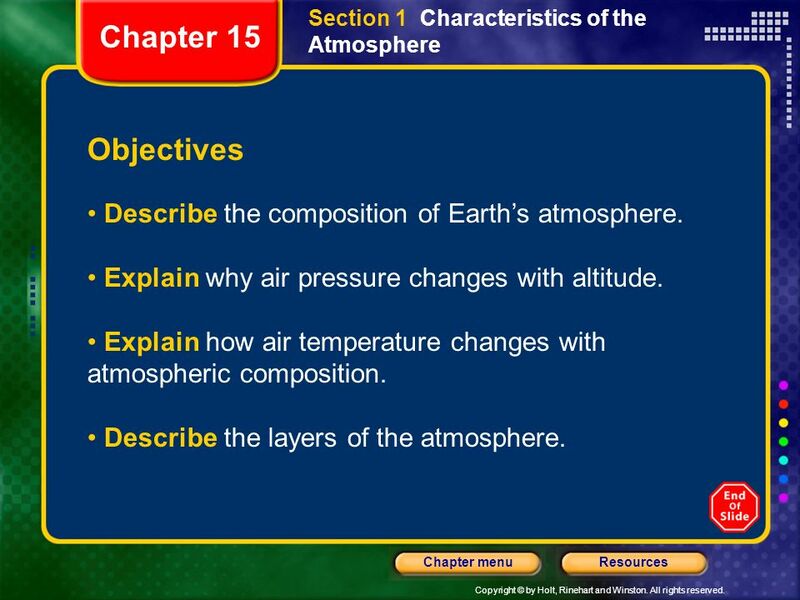 Section 1 Characteristics of the Atmosphere Chapter 15 Objectives Describe the composition of Earth’s atmosphere. Explain why air pressure changes with altitude. 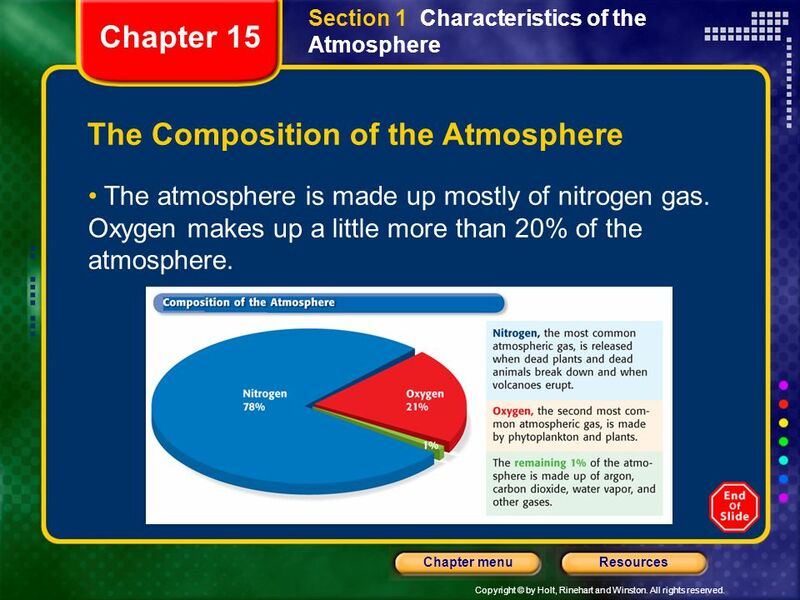 Explain how air temperature changes with atmospheric composition. 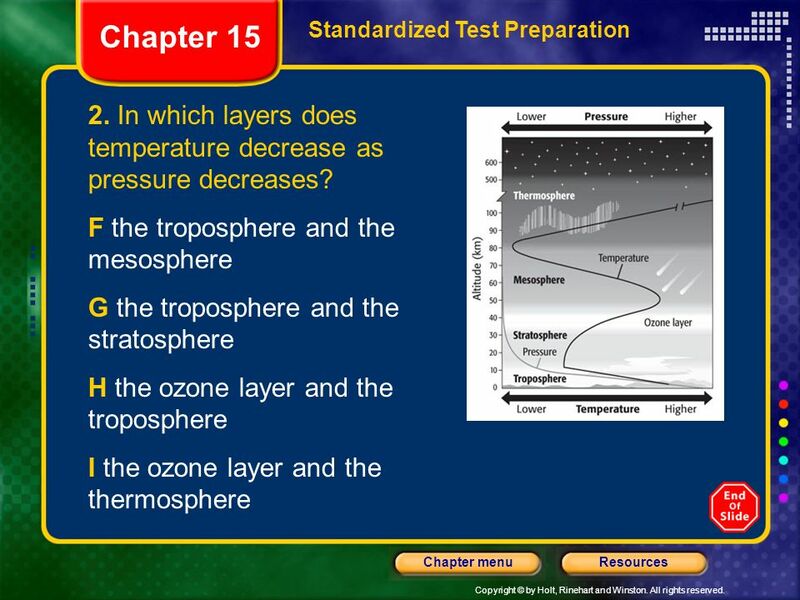 Describe the layers of the atmosphere. 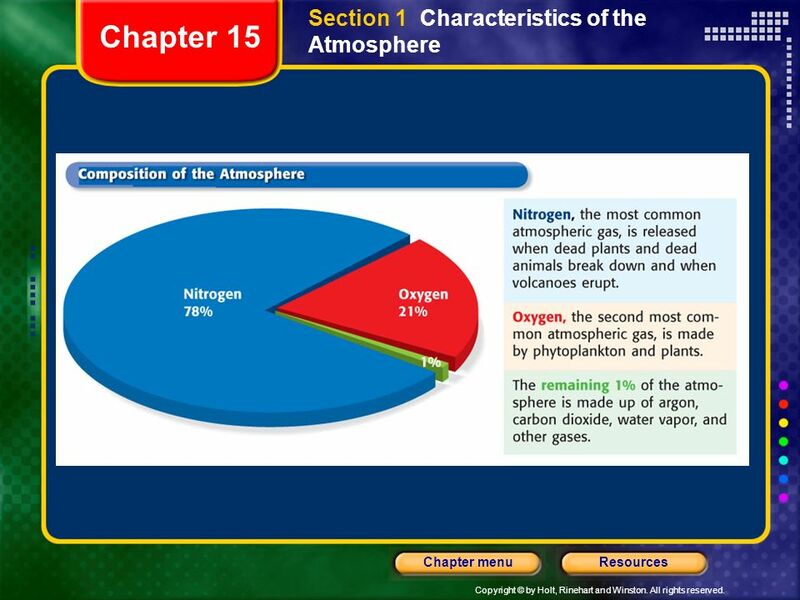 Section 1 Characteristics of the Atmosphere Chapter 15 The Composition of the Atmosphere The atmosphere is made up mostly of nitrogen gas. Oxygen makes up a little more than 20% of the atmosphere. 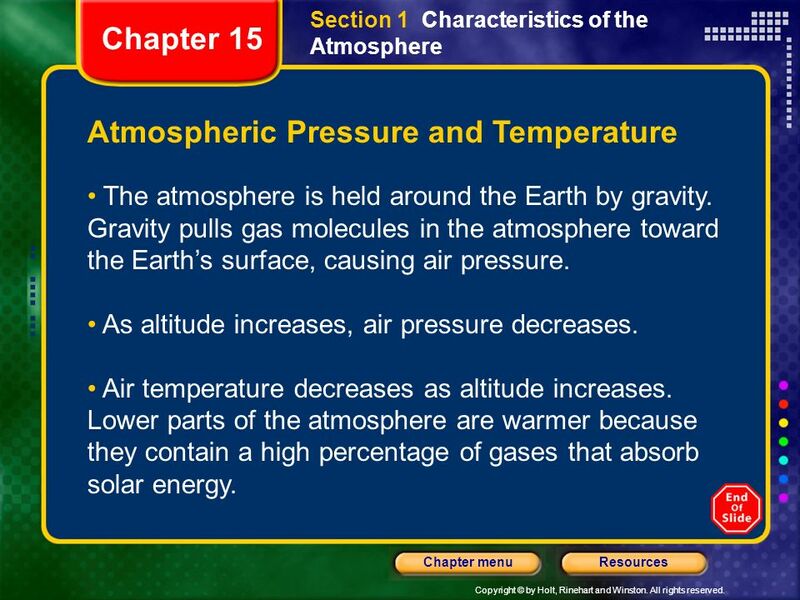 Section 1 Characteristics of the Atmosphere Chapter 15 Atmospheric Pressure and Temperature The atmosphere is held around the Earth by gravity. Gravity pulls gas molecules in the atmosphere toward the Earth’s surface, causing air pressure. As altitude increases, air pressure decreases. Air temperature decreases as altitude increases. Lower parts of the atmosphere are warmer because they contain a high percentage of gases that absorb solar energy. 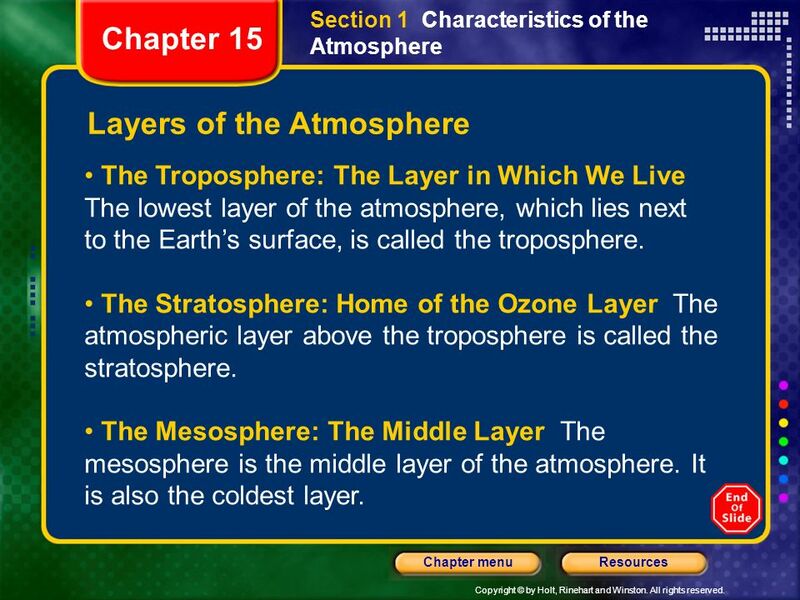 Section 1 Characteristics of the Atmosphere Chapter 15 Layers of the Atmosphere The Troposphere: The Layer in Which We Live The lowest layer of the atmosphere, which lies next to the Earth’s surface, is called the troposphere. The Stratosphere: Home of the Ozone Layer The atmospheric layer above the troposphere is called the stratosphere. The Mesosphere: The Middle Layer The mesosphere is the middle layer of the atmosphere. It is also the coldest layer. 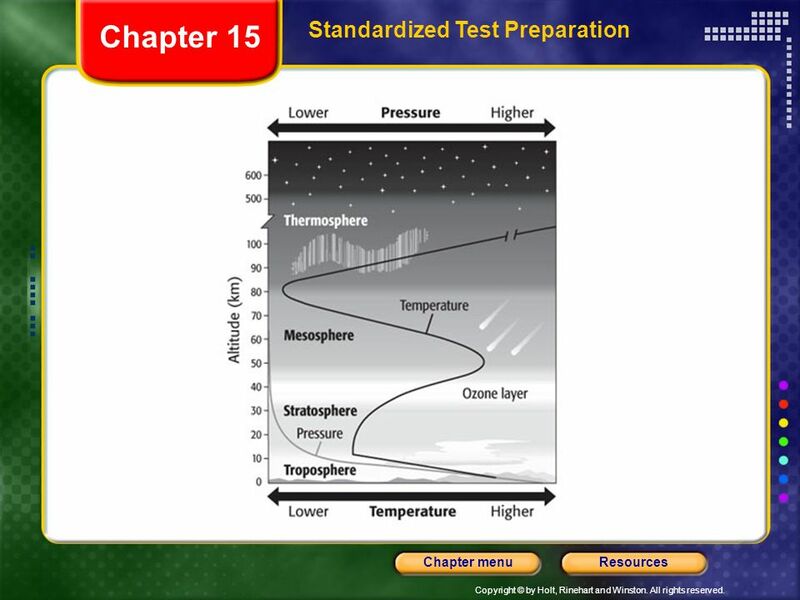 Section 1 Characteristics of the Atmosphere Chapter 15 Layers of the Atmosphere, continued The Thermosphere: The Edge of the Atmosphere The uppermost atmospheric layer is called the thermosphere. The Ionosphere: Home of the Auroras In the upper mesosphere and the lower thermosphere, nitrogen and oxygen atoms absorb harmful solar energy. This area is called the ionosphere. 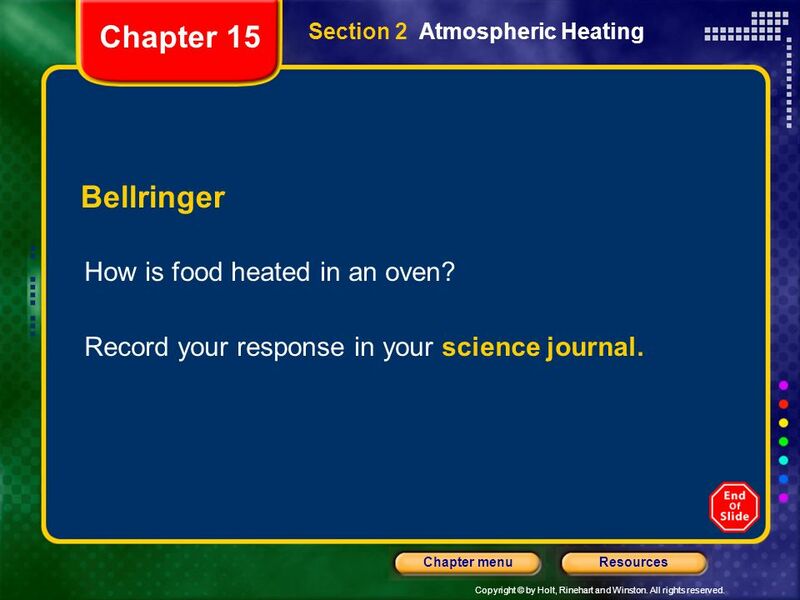 11 Chapter 15 Bellringer How is food heated in an oven? Section 2 Atmospheric Heating Bellringer How is food heated in an oven? Record your response in your science journal. 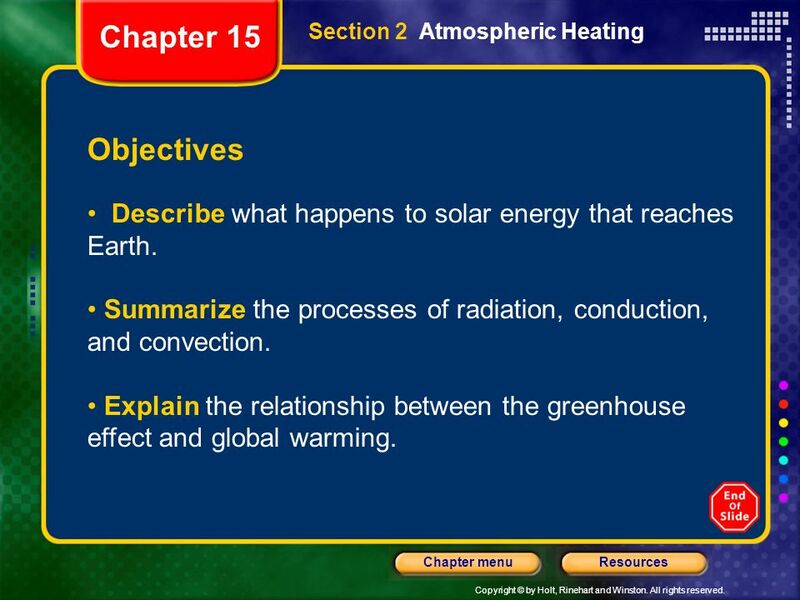 12 Chapter 15 Section 2 Atmospheric Heating Objectives Describe what happens to solar energy that reaches Earth. Summarize the processes of radiation, conduction, and convection. 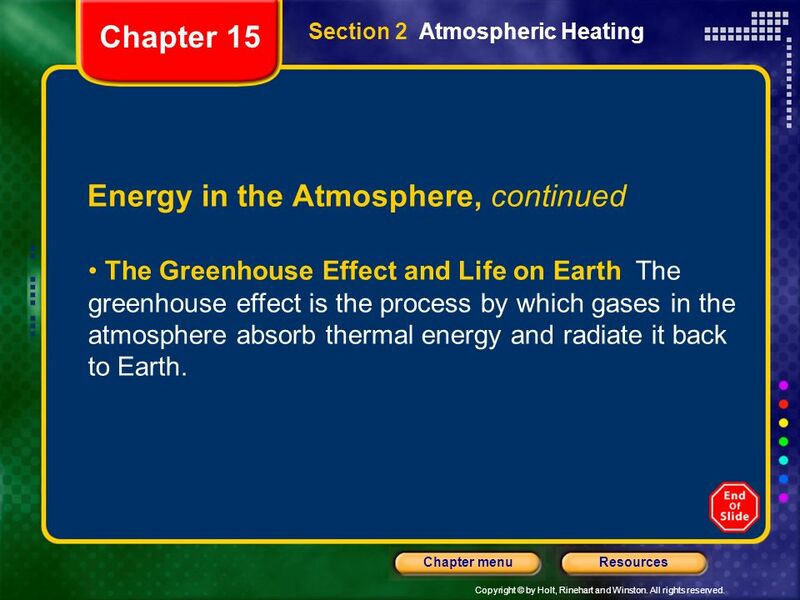 Explain the relationship between the greenhouse effect and global warming. 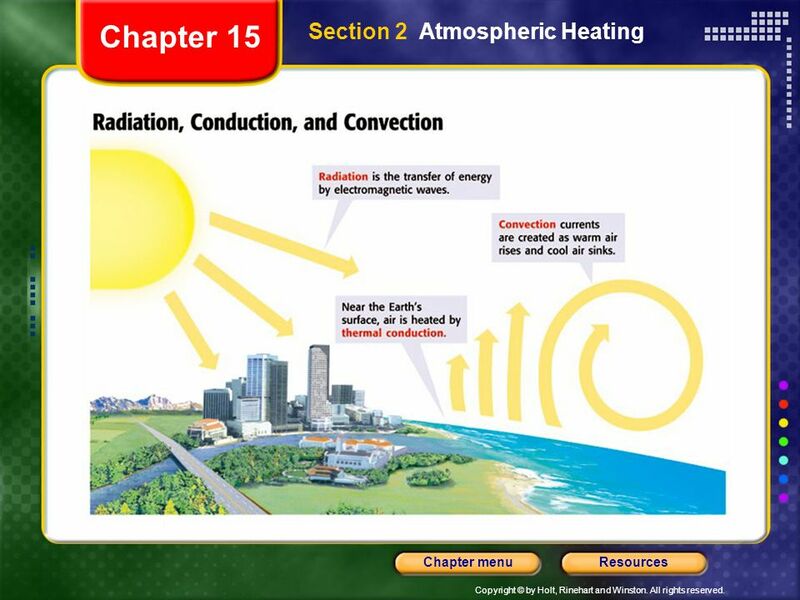 Chapter 15 Section 2 Atmospheric Heating Energy in the Atmosphere Radiation: Energy Transfer by Waves The Earth receives energy from the sun by radiation. Radiation is the transfer of energy as electromagnetic waves. 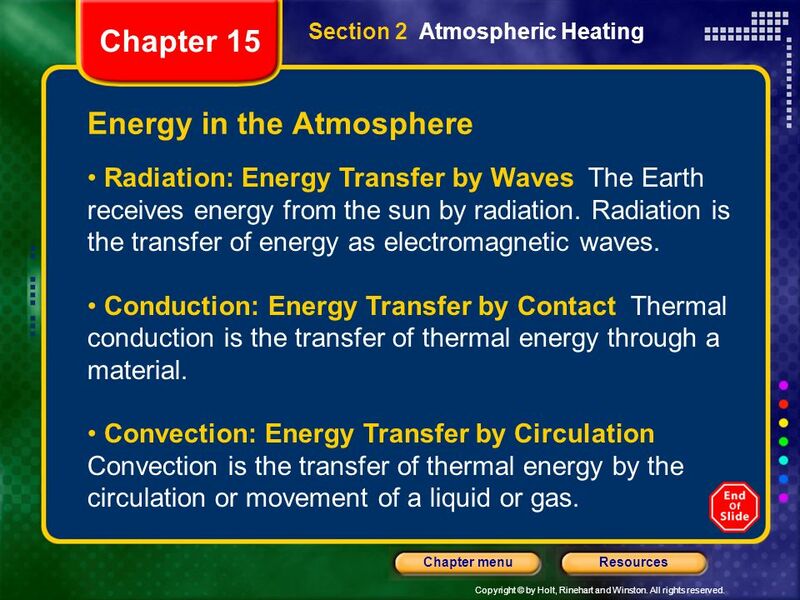 Conduction: Energy Transfer by Contact Thermal conduction is the transfer of thermal energy through a material. Convection: Energy Transfer by Circulation Convection is the transfer of thermal energy by the circulation or movement of a liquid or gas. 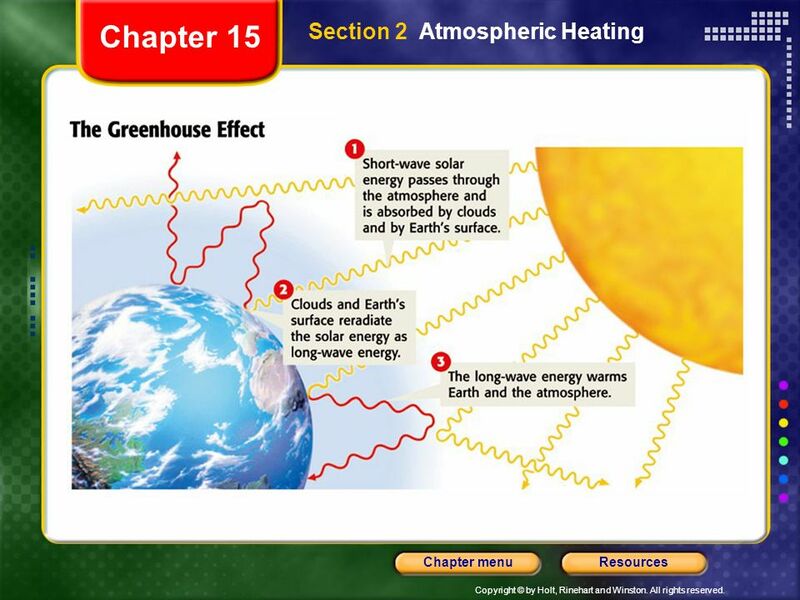 Chapter 15 Section 2 Atmospheric Heating Energy in the Atmosphere, continued The Greenhouse Effect and Life on Earth The greenhouse effect is the process by which gases in the atmosphere absorb thermal energy and radiate it back to Earth. 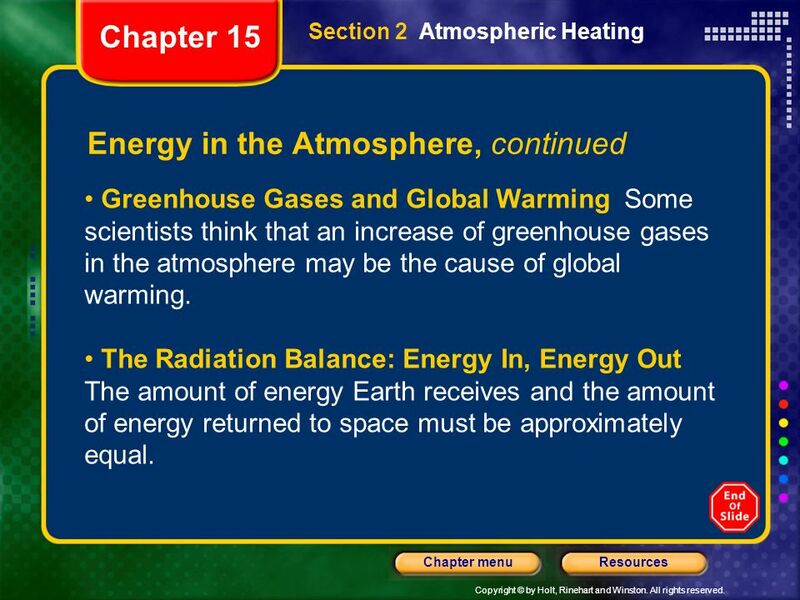 Chapter 15 Section 2 Atmospheric Heating Energy in the Atmosphere, continued Greenhouse Gases and Global Warming Some scientists think that an increase of greenhouse gases in the atmosphere may be the cause of global warming. The Radiation Balance: Energy In, Energy Out The amount of energy Earth receives and the amount of energy returned to space must be approximately equal. 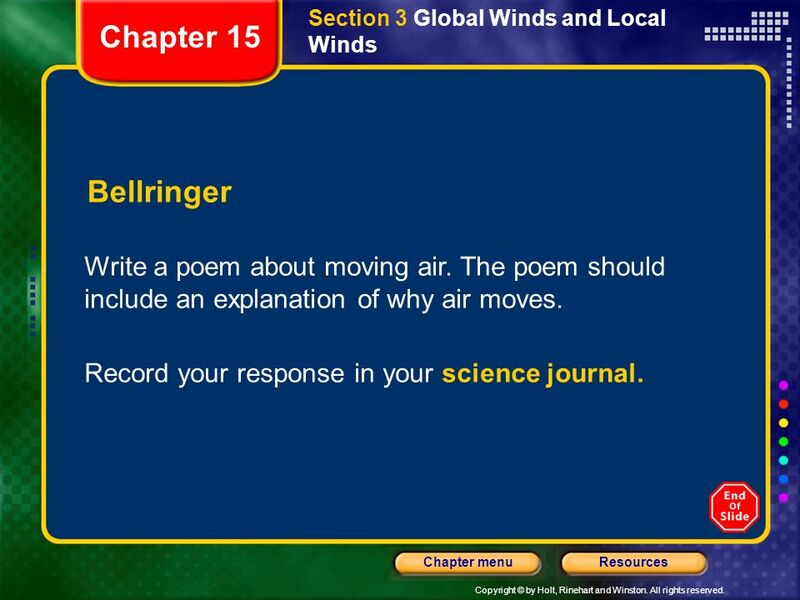 Chapter 15 Bellringer Write a poem about moving air. The poem should include an explanation of why air moves. Record your response in your science journal. 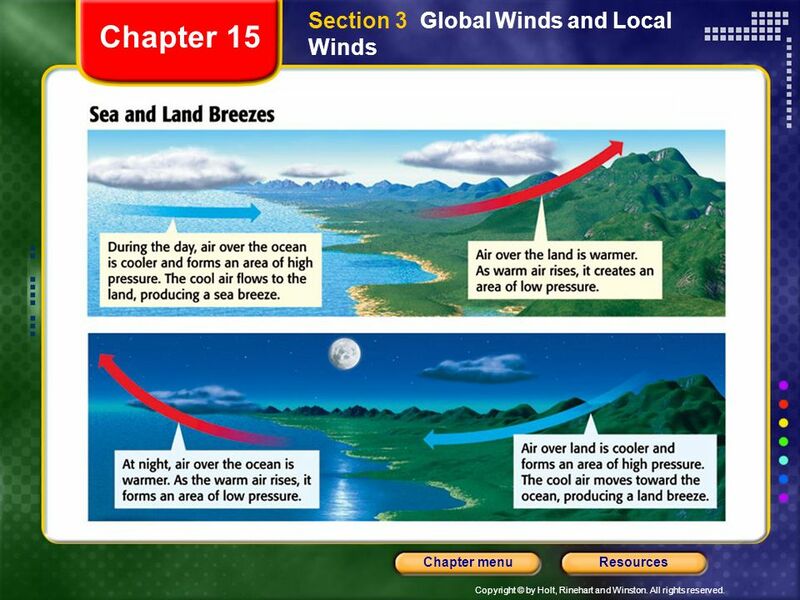 Chapter 15 Objectives Explain the relationship between air pressure and wind direction. 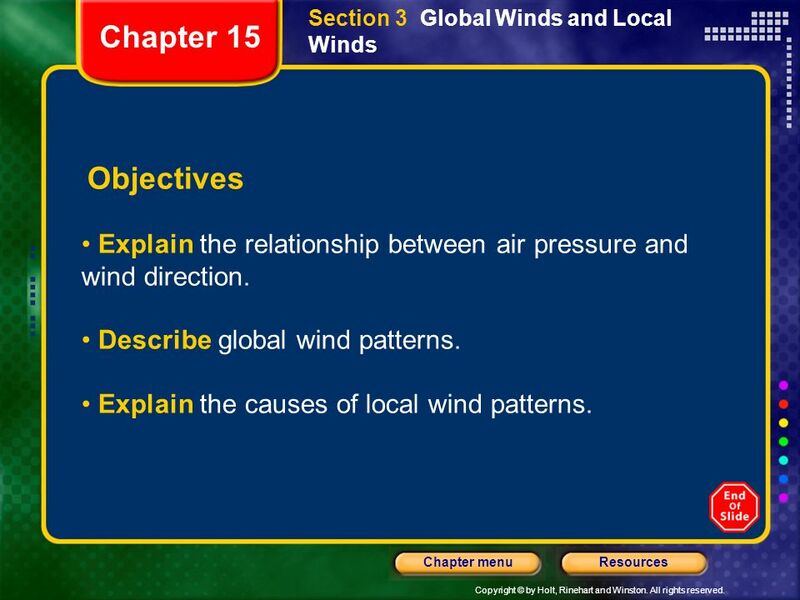 Describe global wind patterns. 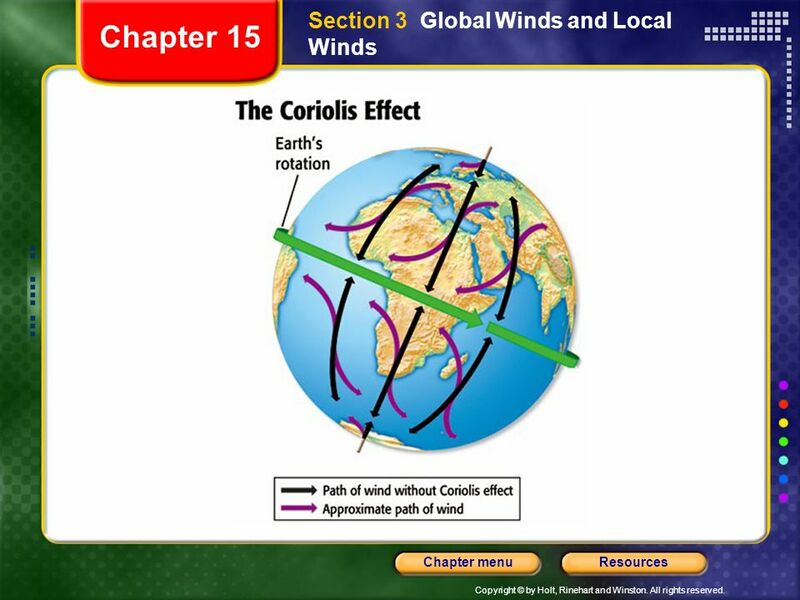 Explain the causes of local wind patterns. 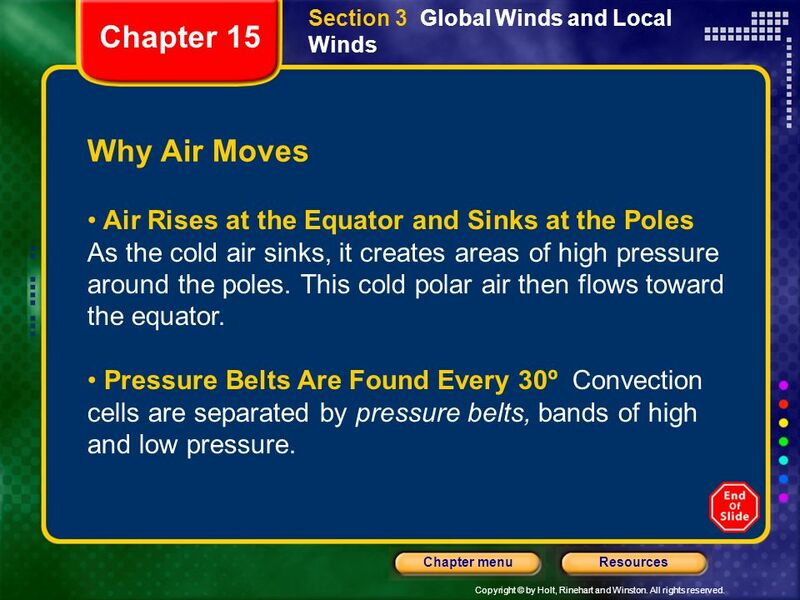 Chapter 15 Why Air Moves Air Rises at the Equator and Sinks at the Poles As the cold air sinks, it creates areas of high pressure around the poles. This cold polar air then flows toward the equator. Pressure Belts Are Found Every 30º Convection cells are separated by pressure belts, bands of high and low pressure. 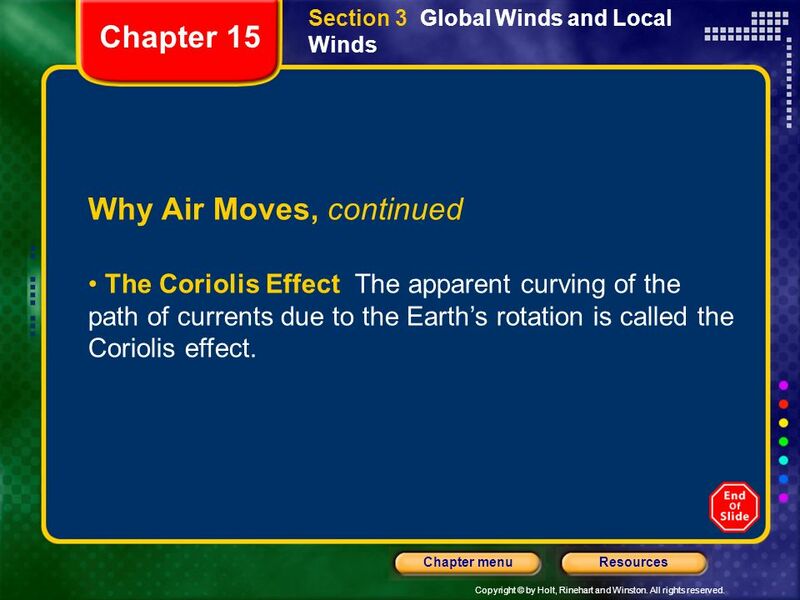 Section 3 Global Winds and Local Winds Chapter 15 Why Air Moves, continued The Coriolis Effect The apparent curving of the path of currents due to the Earth’s rotation is called the Coriolis effect. 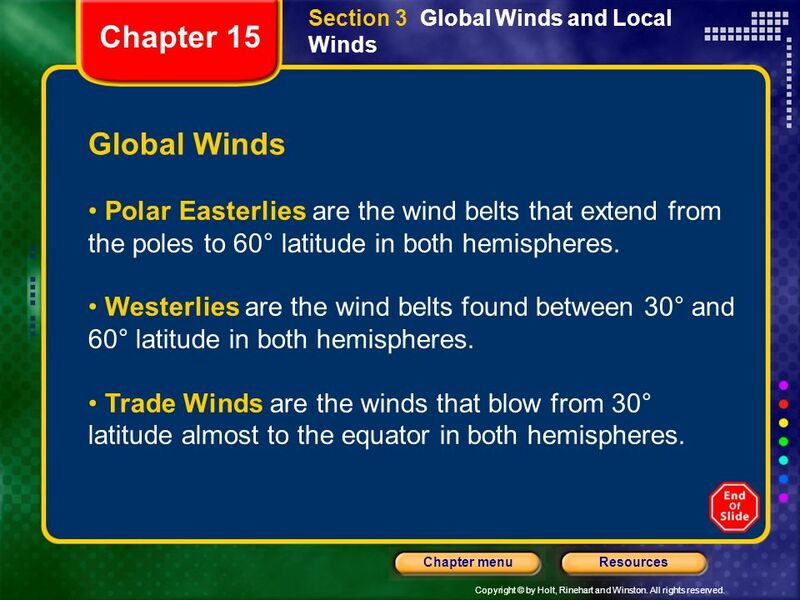 Chapter 15 Global Winds Polar Easterlies are the wind belts that extend from the poles to 60° latitude in both hemispheres. 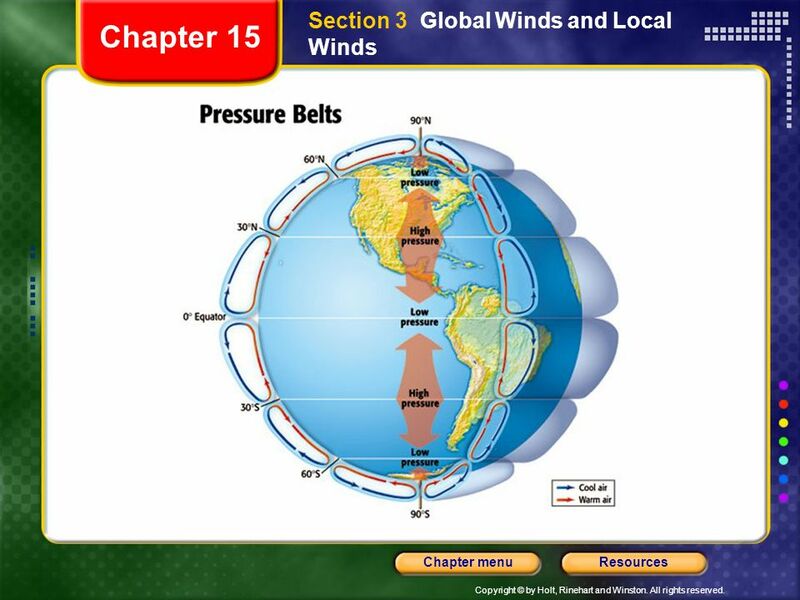 Westerlies are the wind belts found between 30° and 60° latitude in both hemispheres. 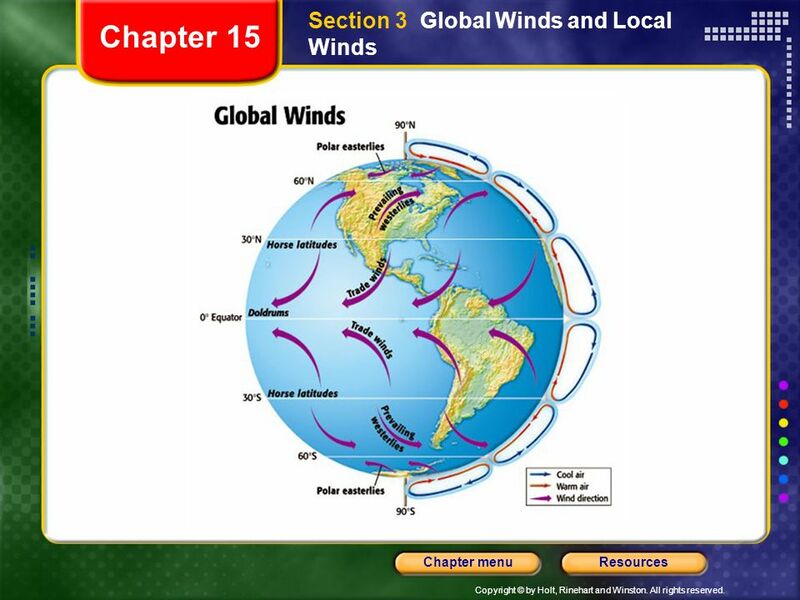 Trade Winds are the winds that blow from 30° latitude almost to the equator in both hemispheres. 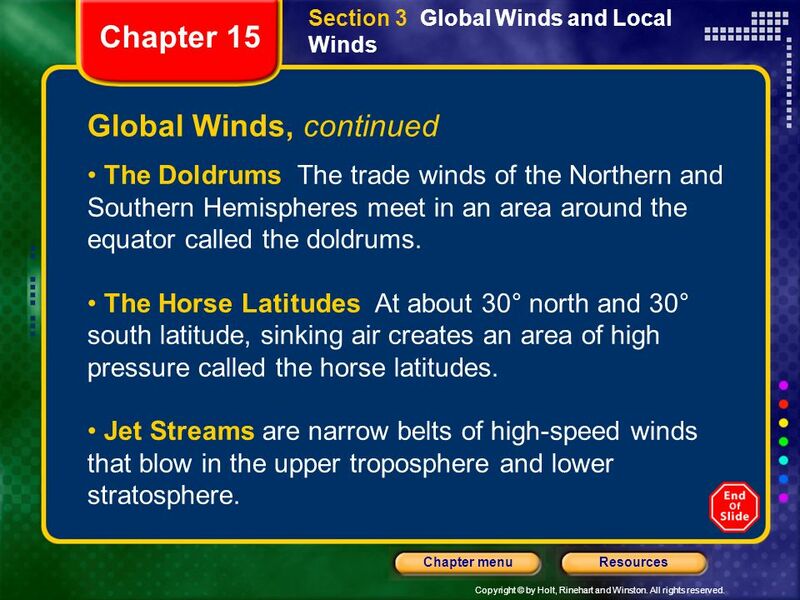 Section 3 Global Winds and Local Winds Chapter 15 Global Winds, continued The Doldrums The trade winds of the Northern and Southern Hemispheres meet in an area around the equator called the doldrums. The Horse Latitudes At about 30° north and 30° south latitude, sinking air creates an area of high pressure called the horse latitudes. Jet Streams are narrow belts of high-speed winds that blow in the upper troposphere and lower stratosphere. 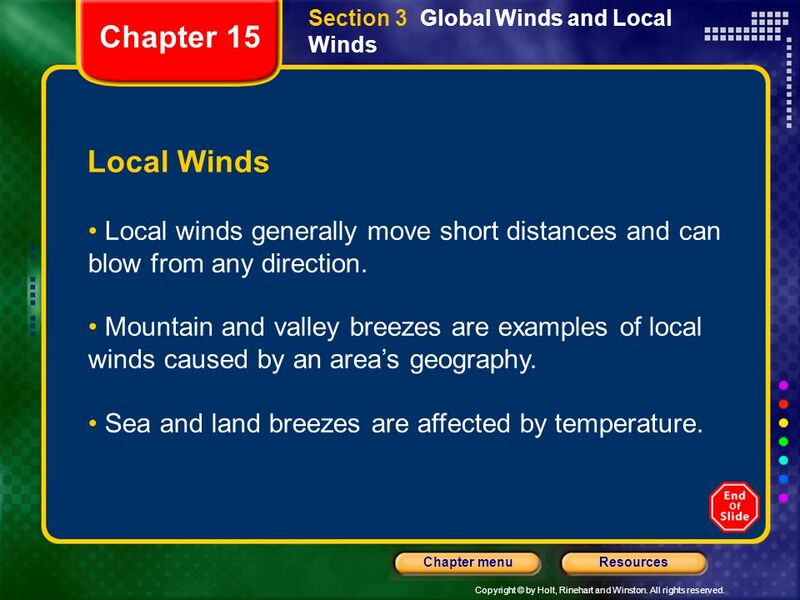 Chapter 15 Local Winds Local winds generally move short distances and can blow from any direction. Mountain and valley breezes are examples of local winds caused by an area’s geography. Sea and land breezes are affected by temperature. 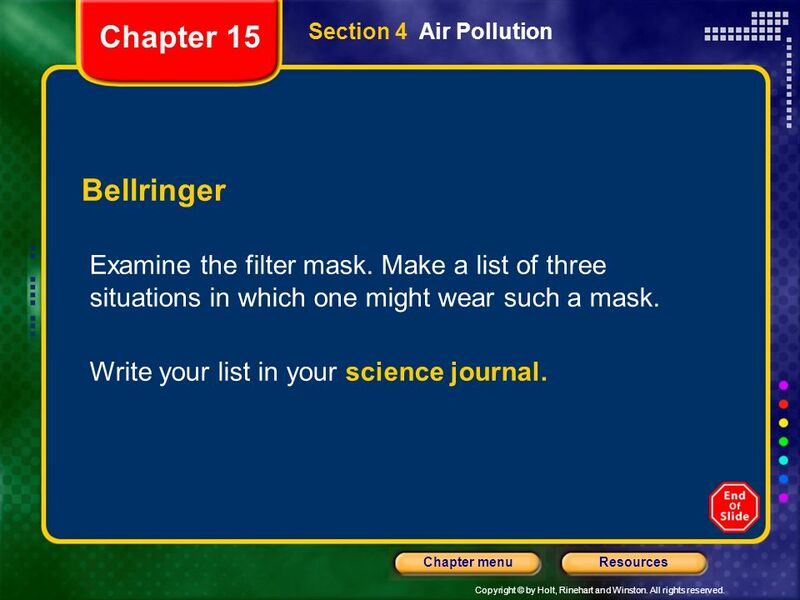 29 Chapter 15 Section 4 Air Pollution Bellringer Examine the filter mask. Make a list of three situations in which one might wear such a mask. Write your list in your science journal. 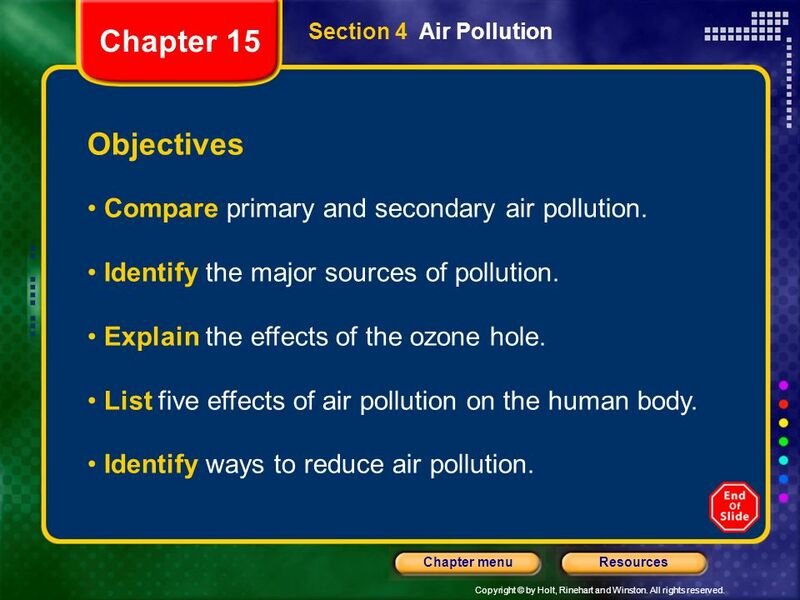 30 Chapter 15 Objectives Compare primary and secondary air pollution. 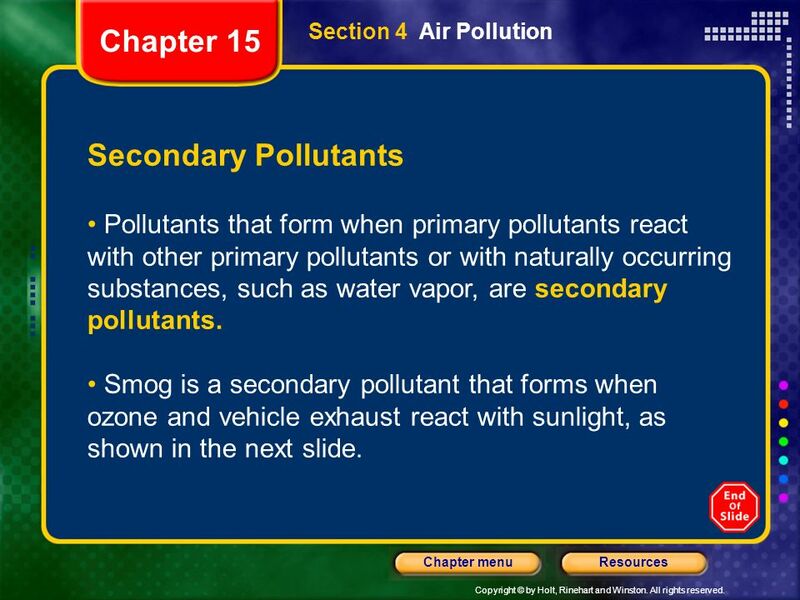 Section 4 Air Pollution Objectives Compare primary and secondary air pollution. Identify the major sources of pollution. 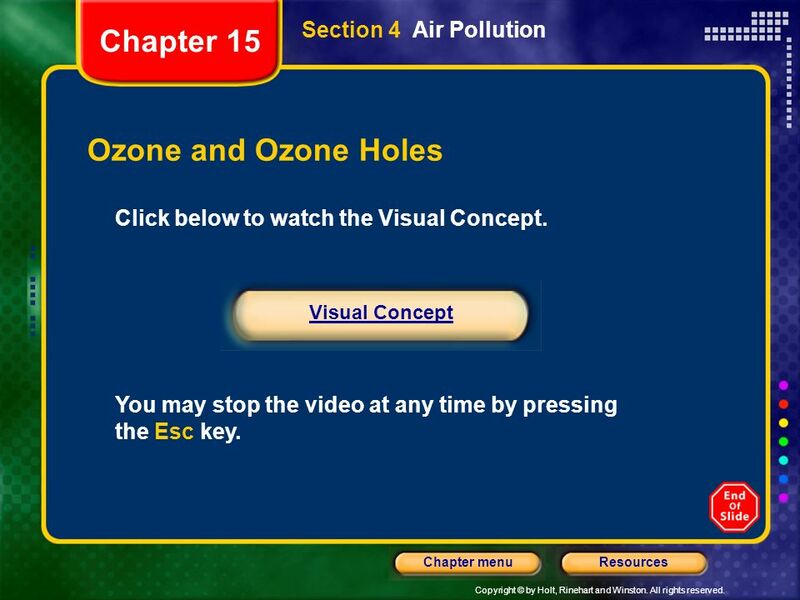 Explain the effects of the ozone hole. List five effects of air pollution on the human body. Identify ways to reduce air pollution. Section 4 Air Pollution Primary Pollutants Pollutants that are put directly into the air by human or natural activity are primary pollutants. 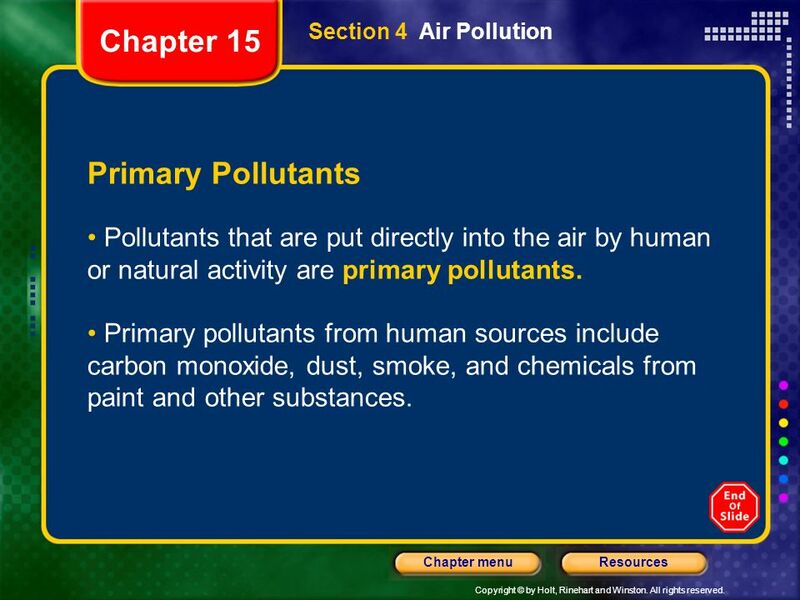 Primary pollutants from human sources include carbon monoxide, dust, smoke, and chemicals from paint and other substances. 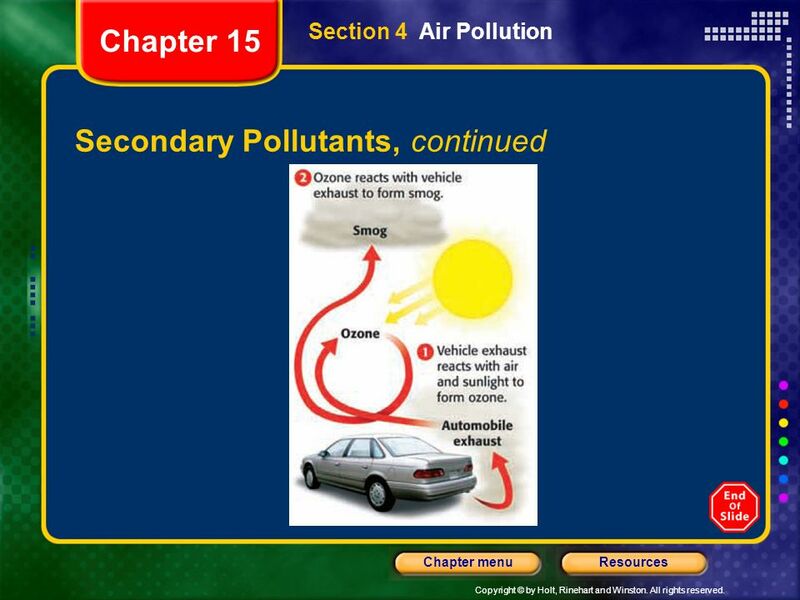 Section 4 Air Pollution Secondary Pollutants Pollutants that form when primary pollutants react with other primary pollutants or with naturally occurring substances, such as water vapor, are secondary pollutants. 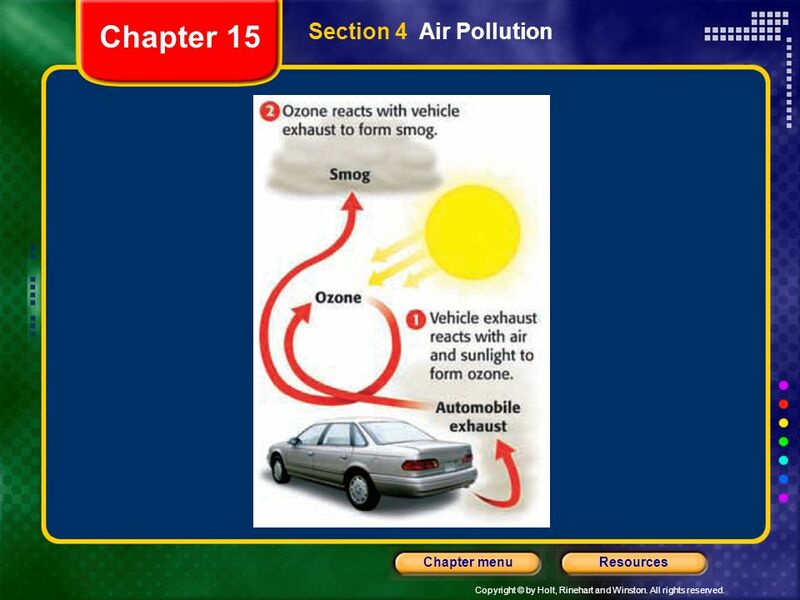 Smog is a secondary pollutant that forms when ozone and vehicle exhaust react with sunlight, as shown in the next slide. 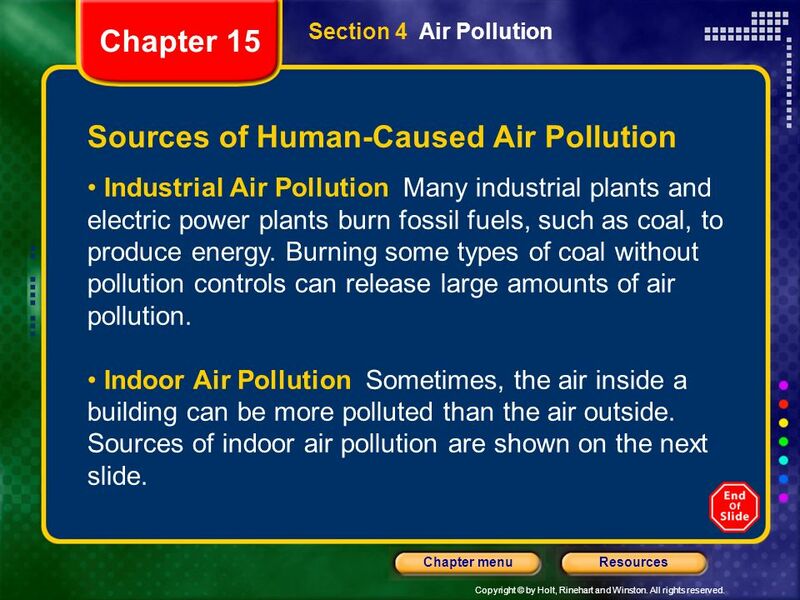 Chapter 15 Section 4 Air Pollution Sources of Human-Caused Air Pollution Industrial Air Pollution Many industrial plants and electric power plants burn fossil fuels, such as coal, to produce energy. Burning some types of coal without pollution controls can release large amounts of air pollution. 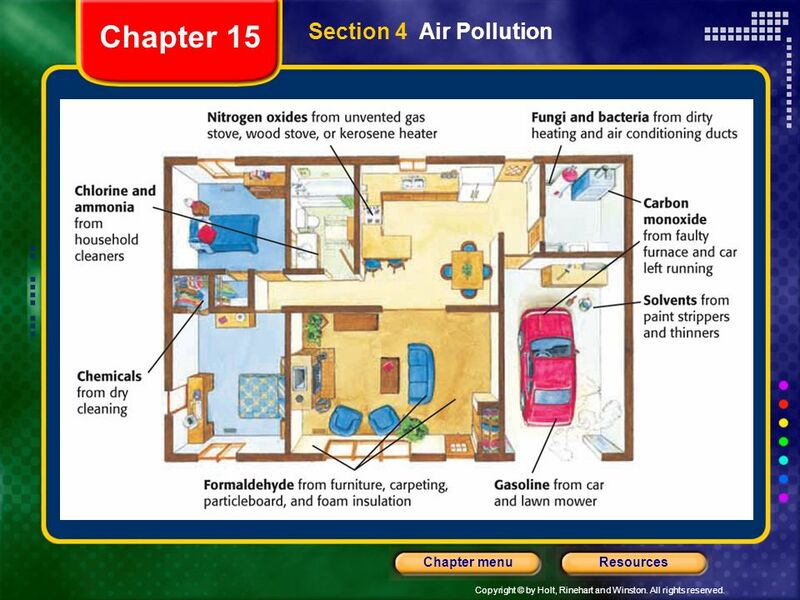 Indoor Air Pollution Sometimes, the air inside a building can be more polluted than the air outside. 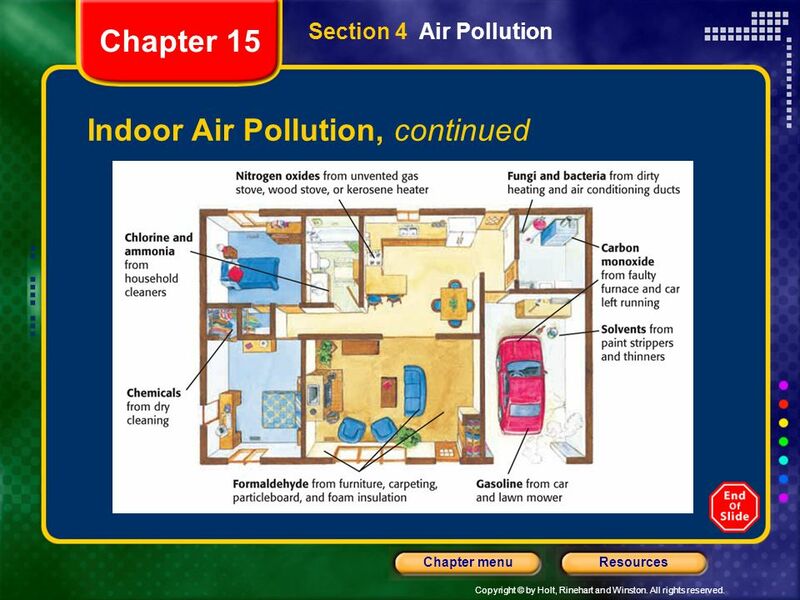 Sources of indoor air pollution are shown on the next slide. 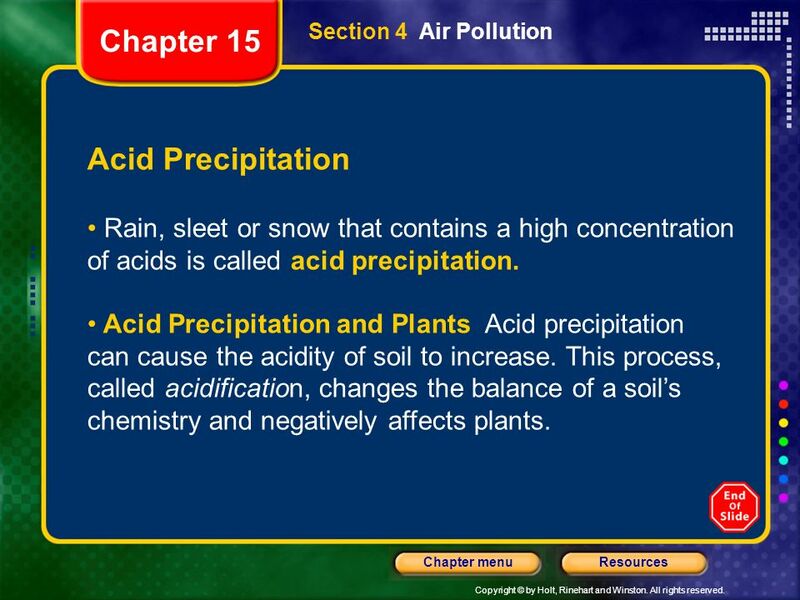 Section 4 Air Pollution Acid Precipitation Rain, sleet or snow that contains a high concentration of acids is called acid precipitation. Acid Precipitation and Plants Acid precipitation can cause the acidity of soil to increase. This process, called acidification, changes the balance of a soil’s chemistry and negatively affects plants. 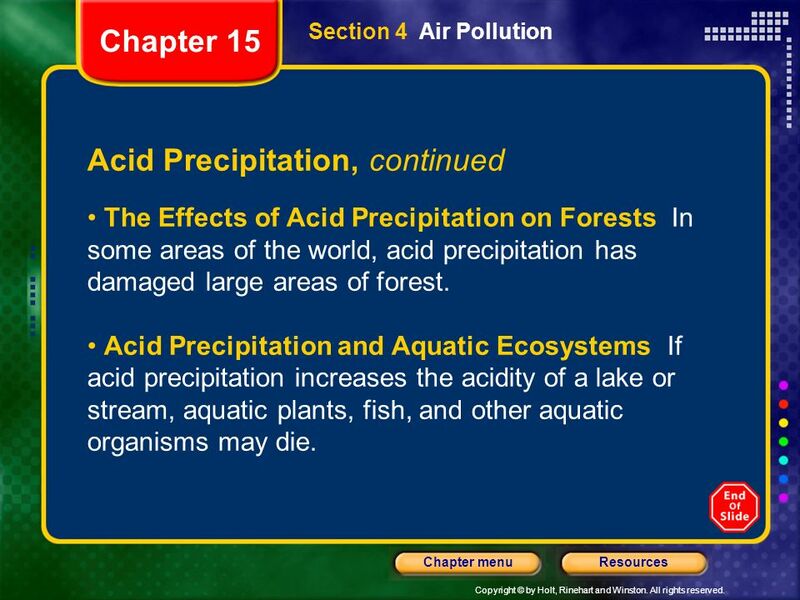 Chapter 15 Section 4 Air Pollution Acid Precipitation, continued The Effects of Acid Precipitation on Forests In some areas of the world, acid precipitation has damaged large areas of forest. Acid Precipitation and Aquatic Ecosystems If acid precipitation increases the acidity of a lake or stream, aquatic plants, fish, and other aquatic organisms may die. 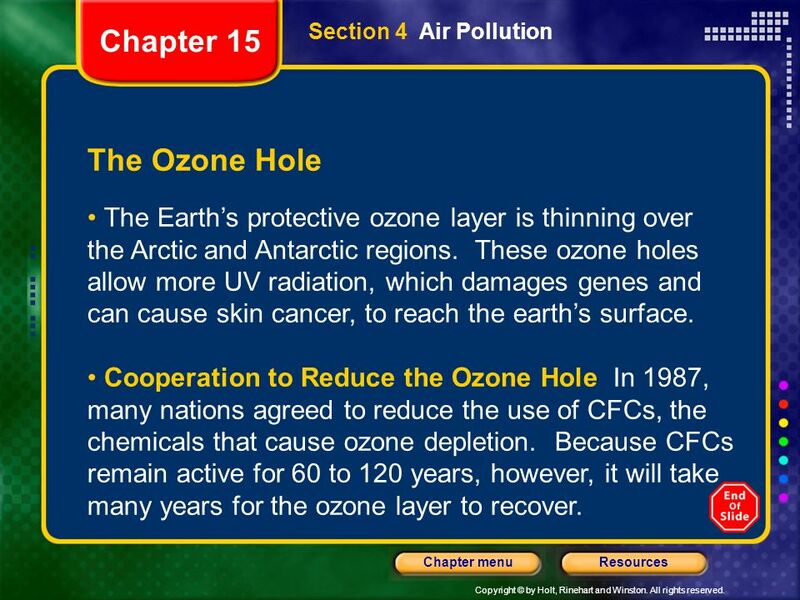 38 Chapter 15 Section 4 Air Pollution The Ozone Hole The Earth’s protective ozone layer is thinning over the Arctic and Antarctic regions. These ozone holes allow more UV radiation, which damages genes and can cause skin cancer, to reach the earth’s surface. Cooperation to Reduce the Ozone Hole In 1987, many nations agreed to reduce the use of CFCs, the chemicals that cause ozone depletion. Because CFCs remain active for 60 to 120 years, however, it will take many years for the ozone layer to recover. 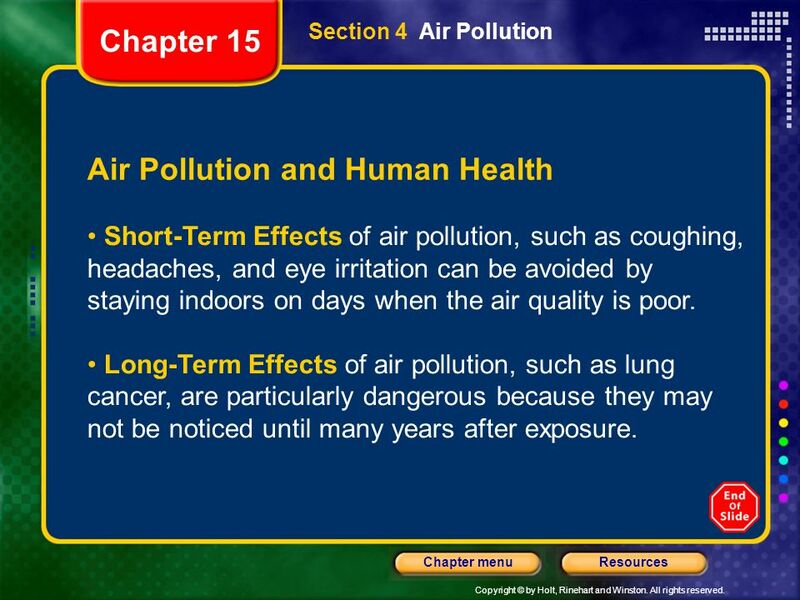 Chapter 15 Section 4 Air Pollution Air Pollution and Human Health Short-Term Effects of air pollution, such as coughing, headaches, and eye irritation can be avoided by staying indoors on days when the air quality is poor. Long-Term Effects of air pollution, such as lung cancer, are particularly dangerous because they may not be noticed until many years after exposure. 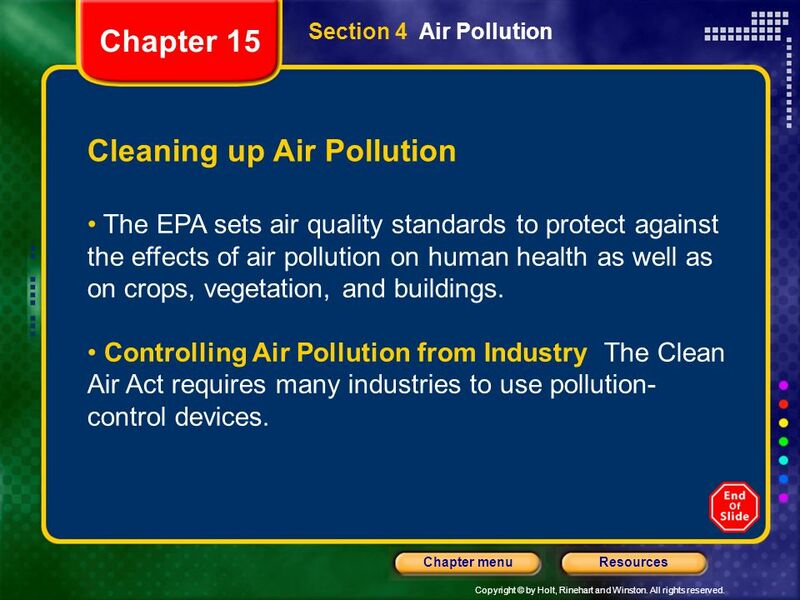 Chapter 15 Section 4 Air Pollution Cleaning up Air Pollution The EPA sets air quality standards to protect against the effects of air pollution on human health as well as on crops, vegetation, and buildings. Controlling Air Pollution from Industry The Clean Air Act requires many industries to use pollution-control devices. 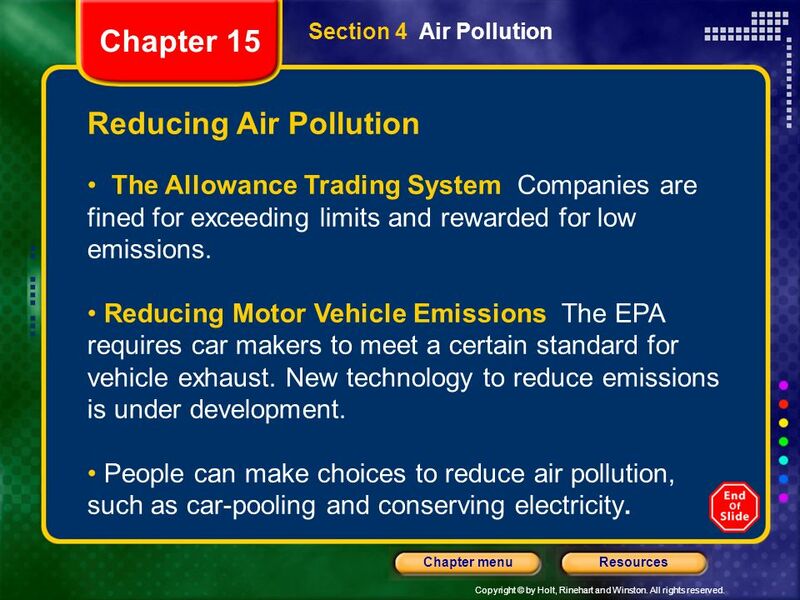 Chapter 15 Section 4 Air Pollution Reducing Air Pollution The Allowance Trading System Companies are fined for exceeding limits and rewarded for low emissions. Reducing Motor Vehicle Emissions The EPA requires car makers to meet a certain standard for vehicle exhaust. New technology to reduce emissions is under development. People can make choices to reduce air pollution, such as car-pooling and conserving electricity. 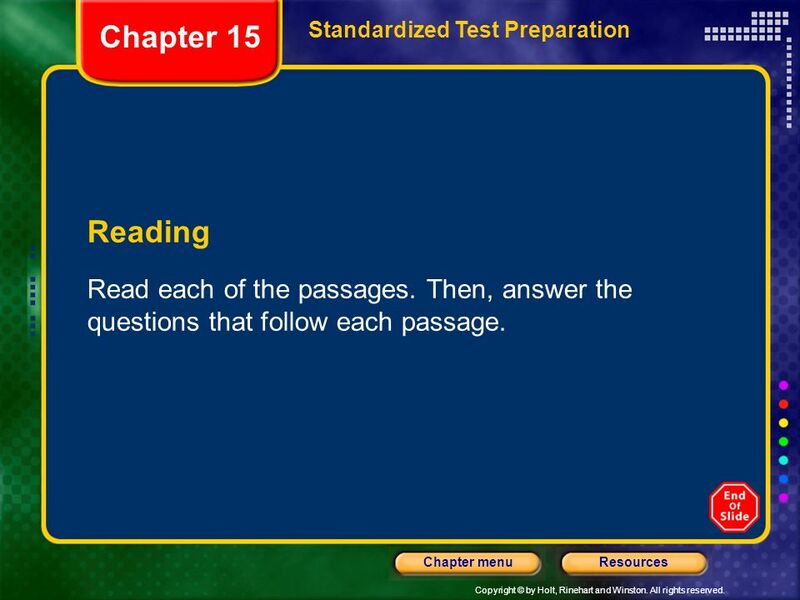 Body text – white 20 points Arial Bold, dark yellow highlights Bullets – dark yellow Copyright – white 12 points Arial Size: Height: 7.52" Width: 10.02" Scale: 70% Position on slide: Horizontal - 0" Vertical - 0"
48 Chapter 15 Standardized Test Preparation Reading Read each of the passages. Then, answer the questions that follow each passage. 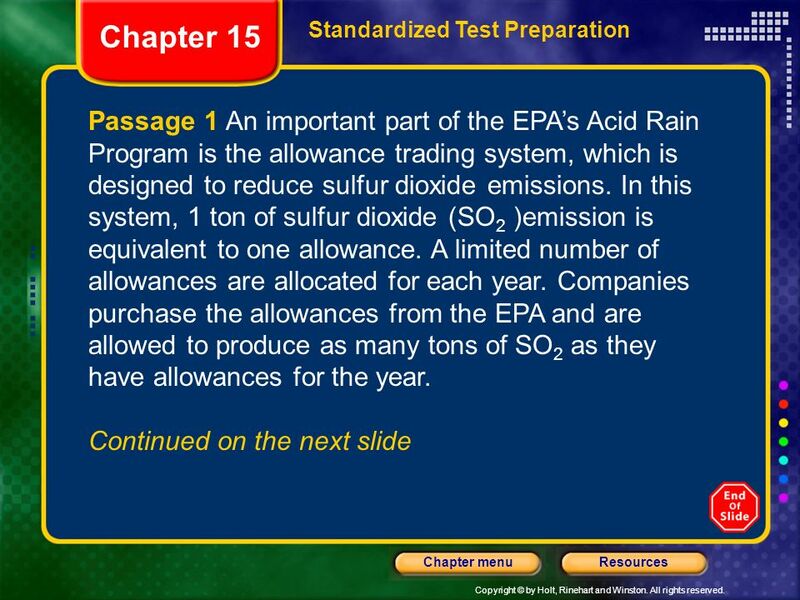 50 Chapter 15 Standardized Test Preparation Passage 1, continued Companies can buy, sell, or trade allowances, but if they exceed their allowances, they must pay a fine. 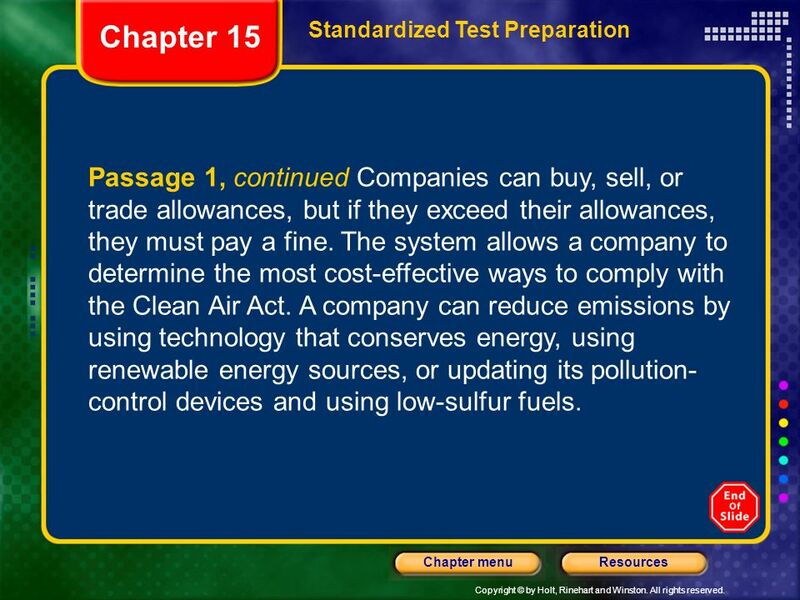 The system allows a company to determine the most cost-effective ways to comply with the Clean Air Act. A company can reduce emissions by using technology that conserves energy, using renewable energy sources, or updating its pollution-control devices and using low-sulfur fuels. 53 Chapter 15 2. 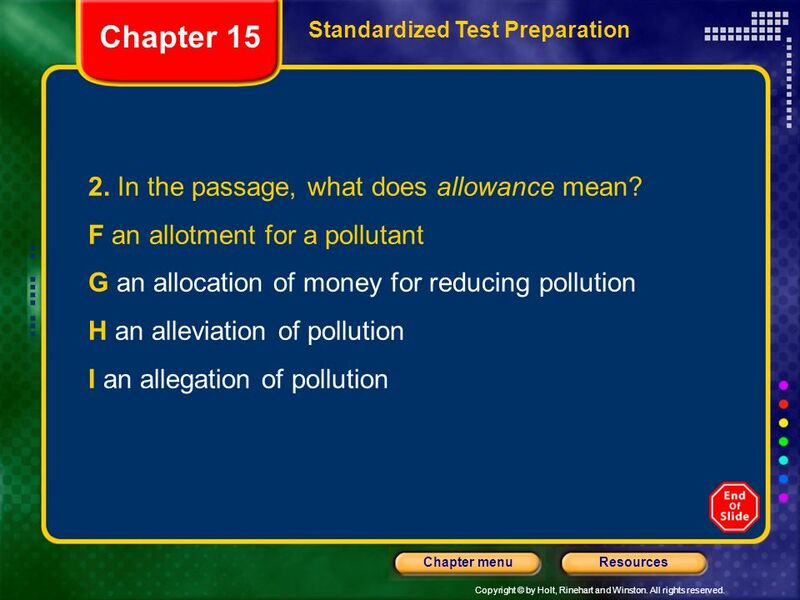 In the passage, what does allowance mean? 54 Chapter 15 2. In the passage, what does allowance mean? 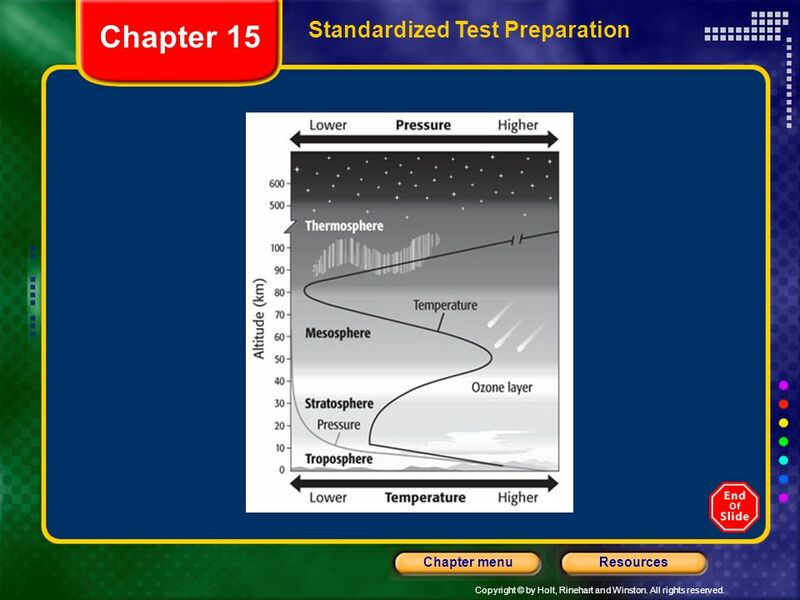 56 Chapter 15 Standardized Test Preparation Passage 2, continued As the dry air flows over the mountaintop, it compresses and heats the air below. The warm, dry wind that results is worthy of the name “snow eater” because it melts a half meter of snow in a few hours! The temperature change caused when a chinook rushes down a mountainside can also be dramatic. In 1943 in Spearfish, South Dakota, the temperature at 7:30 in the morning was –4°F. But two minutes later, a chinook caused the temperature to soar 49° to 45°F. 57 Chapter 15 Standardized Test Preparation 1. 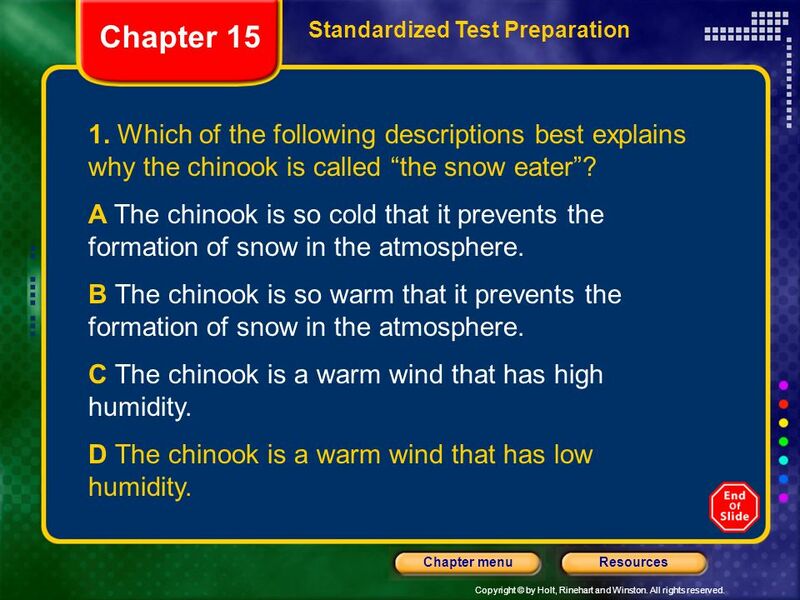 Which of the following descriptions best explains why the chinook is called “the snow eater”? A The chinook is so cold that it prevents the formation of snow in the atmosphere. B The chinook is so warm that it prevents the formation of snow in the atmosphere. C The chinook is a warm wind that has high humidity. D The chinook is a warm wind that has low humidity. 58 Chapter 15 Standardized Test Preparation 1. 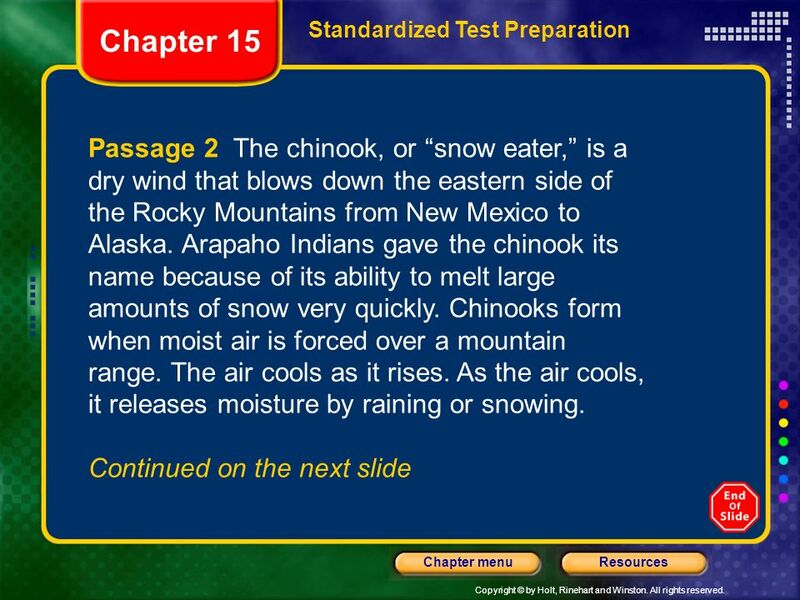 Which of the following descriptions best explains why the chinook is called “the snow eater”? A The chinook is so cold that it prevents the formation of snow in the atmosphere. B The chinook is so warm that it prevents the formation of snow in the atmosphere. C The chinook is a warm wind that has high humidity. D The chinook is a warm wind that has low humidity. 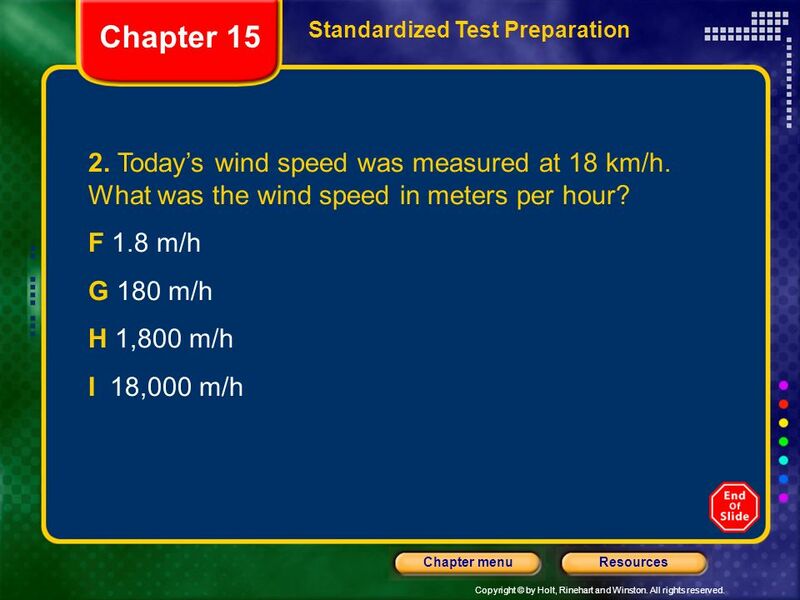 59 Chapter 15 Standardized Test Preparation 2. 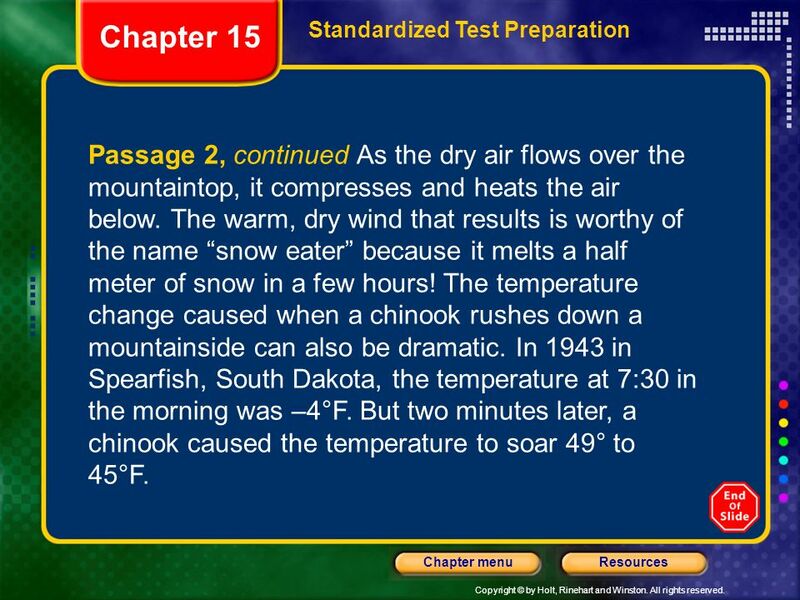 According to the passage, at what time did the temperature reach 45°F in Spearfish, South Dakota? F 7:30 p.m. G 7:32 p.m. H 7:30 a.m. I 7:32 a.m.
60 Chapter 15 Standardized Test Preparation 2. According to the passage, at what time did the temperature reach 45°F in Spearfish, South Dakota? F 7:30 p.m. G 7:32 p.m. H 7:30 a.m. 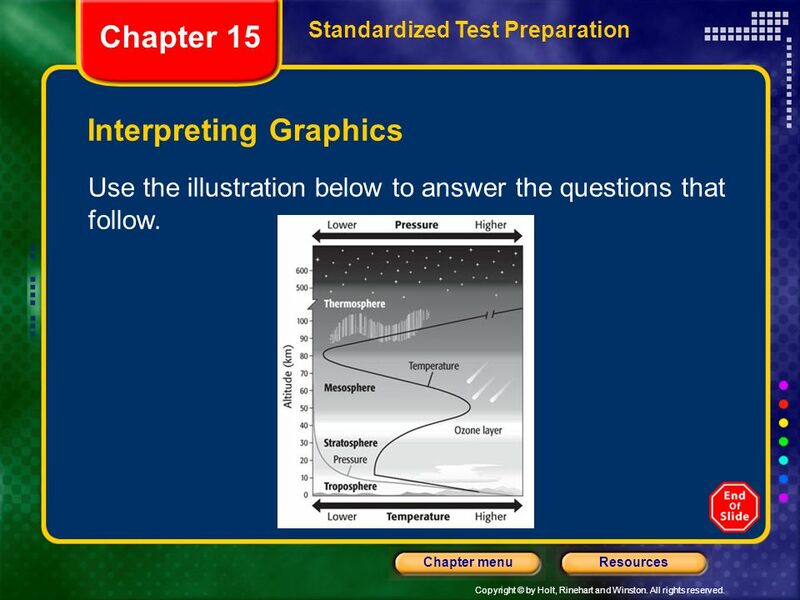 I 7:32 a.m.
Chapter 15 Standardized Test Preparation Interpreting Graphics Use the illustration below to answer the questions that follow. 62 Chapter 15 Standardized Test Preparation 1. 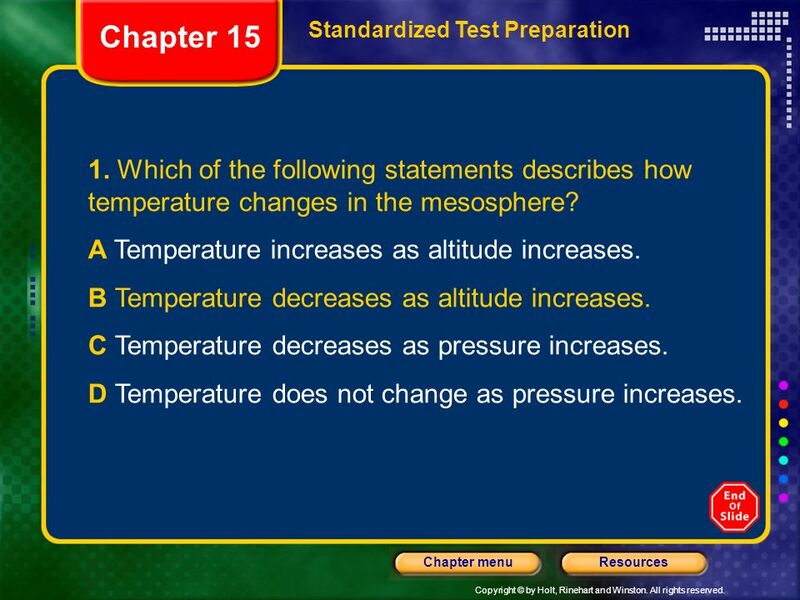 Which of the following statements describes how temperature changes in the mesosphere? A Temperature increases as altitude increases. B Temperature decreases as altitude increases. C Temperature decreases as pressure increases. 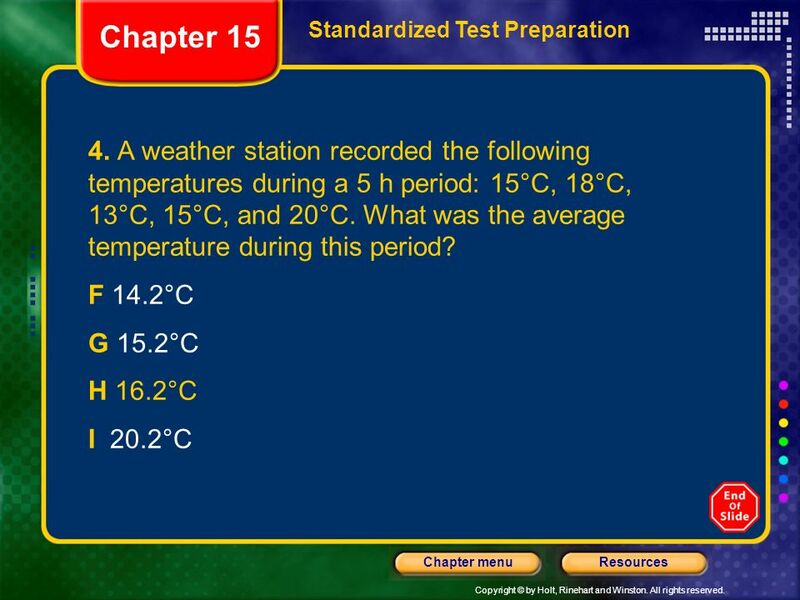 D Temperature does not change as pressure increases. 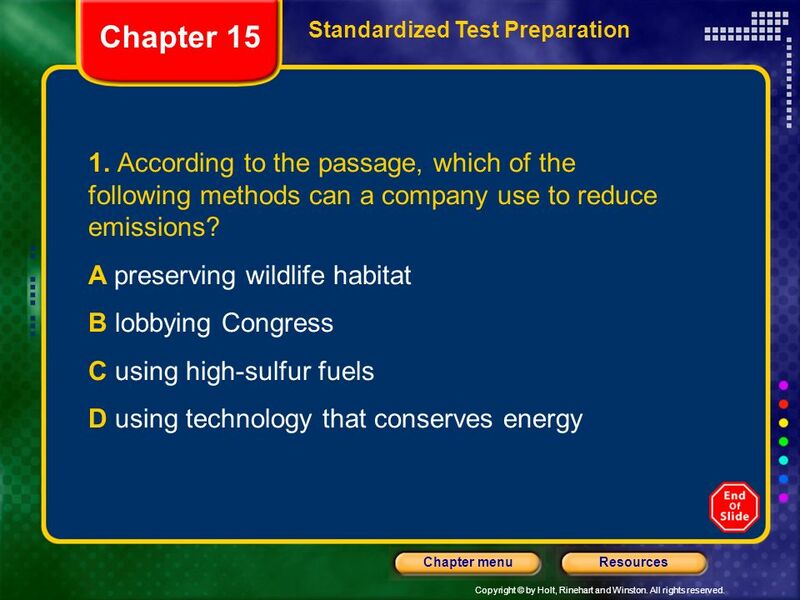 63 Chapter 15 Standardized Test Preparation 1. Which of the following statements describes how temperature changes in the mesosphere? A Temperature increases as altitude increases. B Temperature decreases as altitude increases. C Temperature decreases as pressure increases. D Temperature does not change as pressure increases. 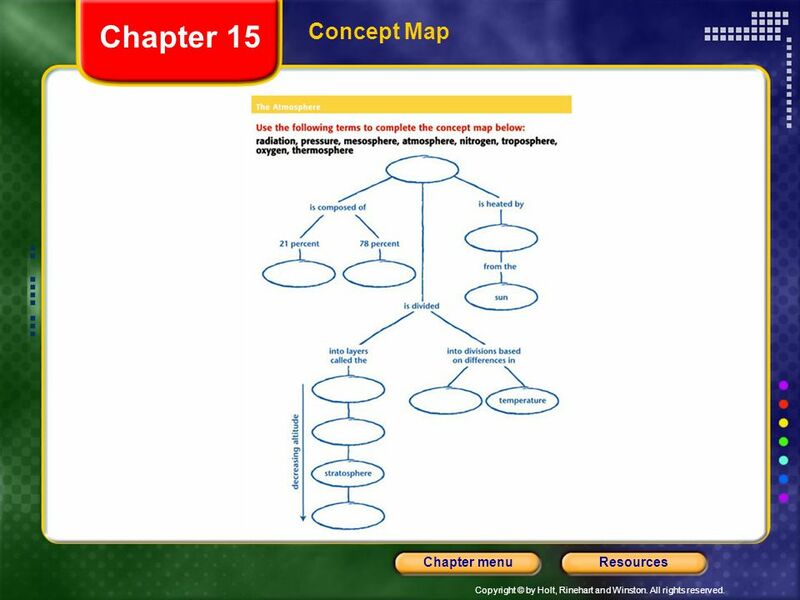 69 Chapter 15 Math Read each question and choose the best answer. 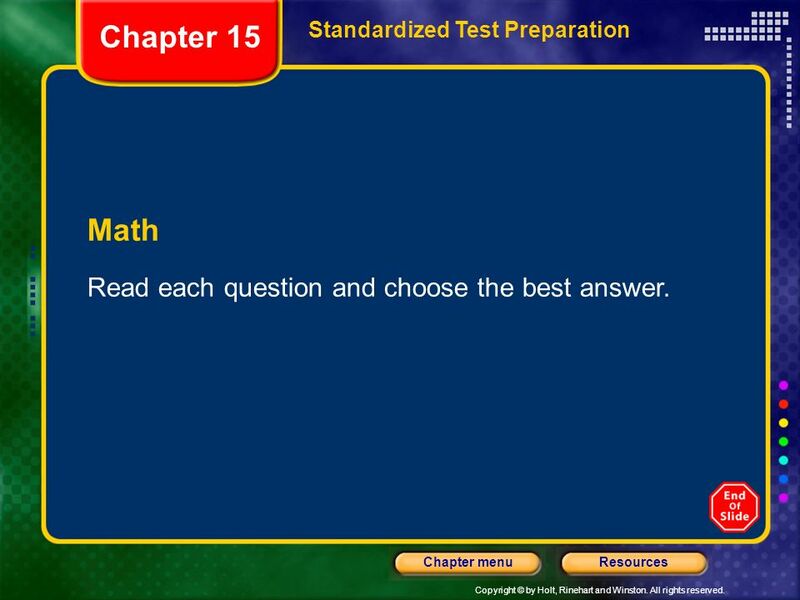 Standardized Test Preparation Math Read each question and choose the best answer. 83 Chapter 15 Standardized Test Preparation Use the illustration below to answer the questions that follow. Download ppt "How to Use This Presentation How to Use This Presentation"
Bell work Write a poem about moving air. The poem should include an explanation of why air moves. 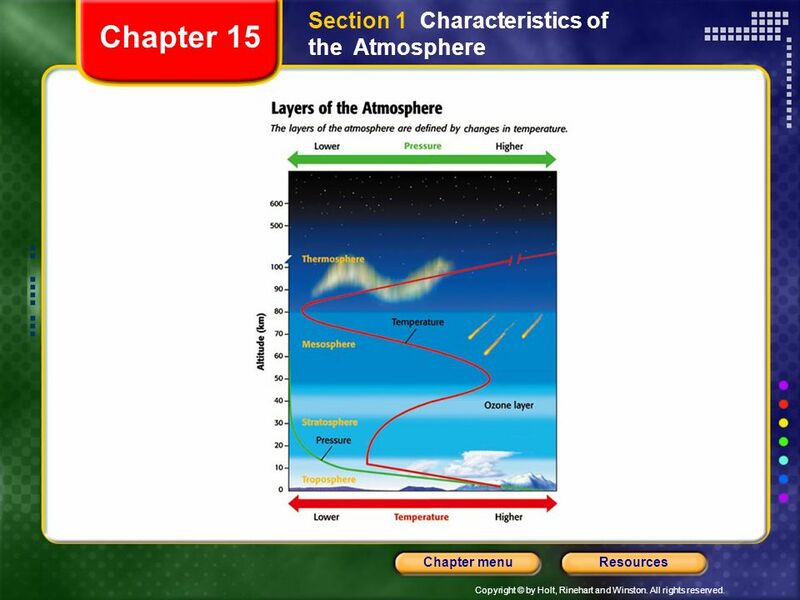 Earth Science Chapter 7 Atmosphere. What are the narrow belts of winds that can reach 250 MPH called? 0 of Jet currents 2. Convection currents 3. 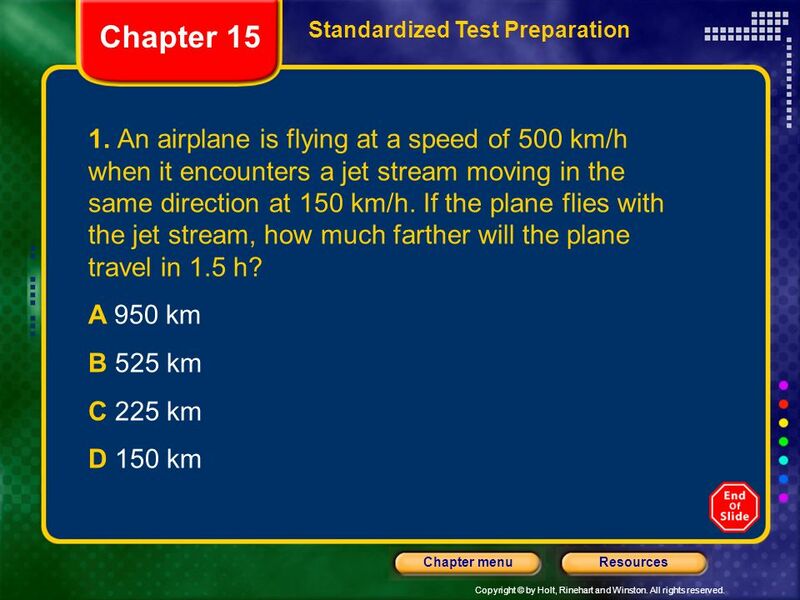 Jet streams 4. Convection streams. 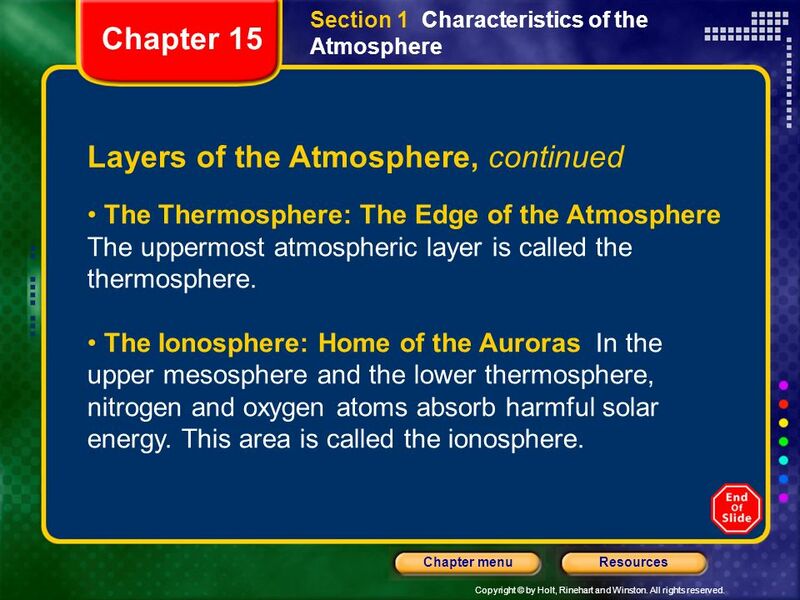 Chapter 6 The Atmosphere 6 th Grade. 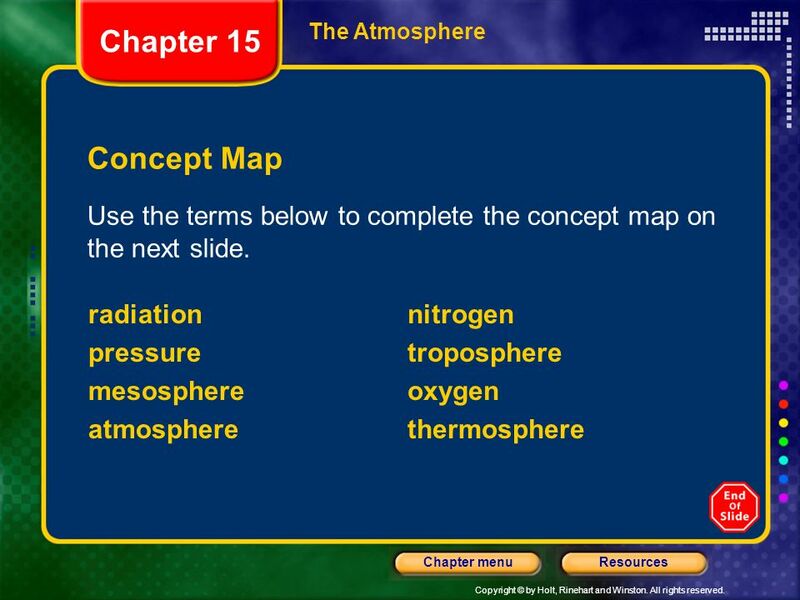 Section 1 The atmosphere is a mixture of gases that surrounds the earth. It contains the oxygen you breathe and protects. 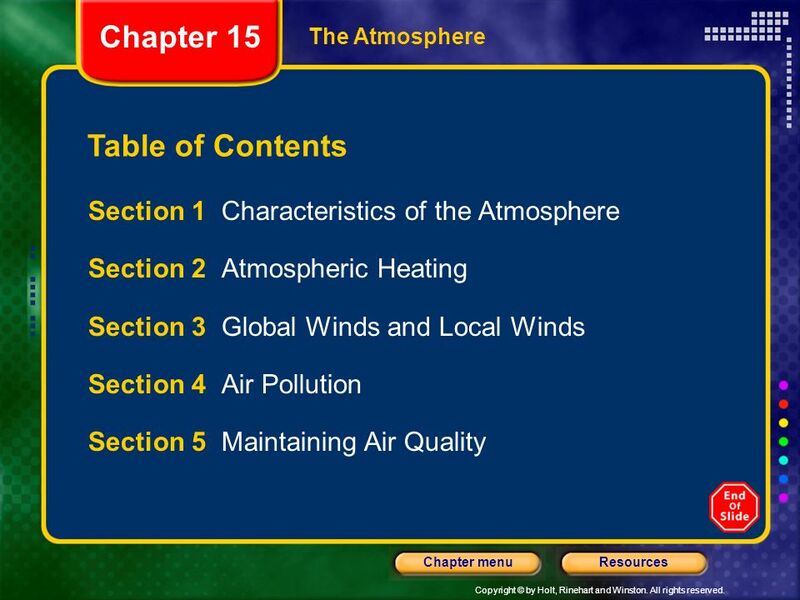 Atmosphere and Winds E4.p2X-A,F, I. CHARACTERISTICS OF THE ATMOSPHERE. Earth’s Oceans and Weather Systems Weather Factors. Composition of the atmosphere; Contains layers based on altitude and pressure 78%, from volcanic eruptions and when dead plants and animals. 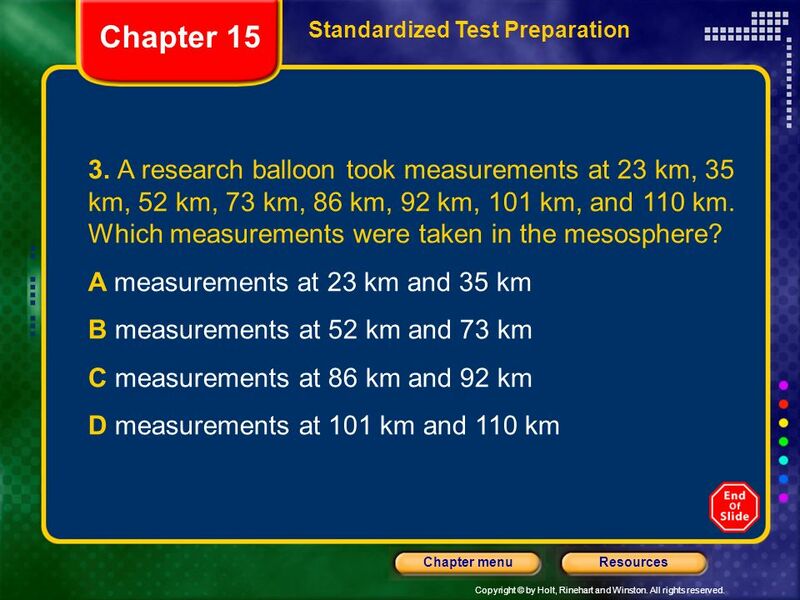 Chapter 15 Test Review The Atmosphere. The Atmosphere “Vapor Globe/Ball”. Composition  78% Nitrogen  21% Oxygen  1% Other (Argon, Carbon Dioxide, Water Vapor, other gases)  78% Nitrogen. the state of the atmosphere at a given time and place depends on: amount of cloudstemperature air pressurewind amount of moisture.